We passed our 30th anniversary in June and couldn't get away at that time so we took this time in July to celebrate our 30th Anniversary. We took an Uber car to Midway airport about 8:30am. We got there early as recommended to allow plenty of time to get through the TSA security screenings which ended up being a pretty quick affair. Of course we had to take off shoes and go through the body scanners, etc., but we got through fine and had two hours to kill until the departure time. Finally we boarded and were on our way to Toronto, Canada. Jeff had kept this trip all very secret from Joyce. She didn't even know they were flying somewhere until 2 days before they left. Once we got to the airport we obviously knew where the flight was taking us. Joyce asked what was in Toronto, Jeff's response was to wait and see. It was a beautiful day and an hour and 15 minutes would put us in Toronto about 2pm where it was 75 and sunny. Porter Airlines Bombardier Q400 airplanes. We flew over Lake Michigan and saw the sailboats and other boats enjoying the gorgeous day. We arrived in Toronto only to find that we were catching another flight to Quebec City. Oh my! Certainly a surprise! The second flight was expected to take about an hour and 15 minutes. It was 15C (59F) in Quebec City with light rain. We were able to gets seats very near the front of the airplane for both flights which was nice. 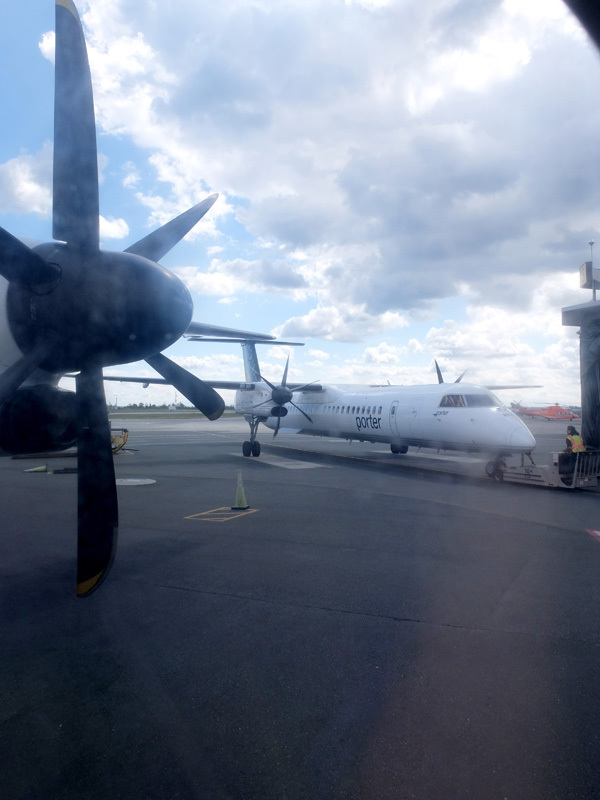 This was the first time we flew Porter Airlines. They run smallish shuttle turboprops that have 74 seats so loading and unloading is not too bad. Plus they had a cart where you could put your carry-on bag just before you got on the plane. They then loaded those carry-ons in the cargo bay so you wouldn’t have to worry about the using overhead bins inside the airplane. When you land, they have your carry-ons waiting for you as you exit the airplane. Kind of nice not to deal with the carry-on bags and it doesn’t cost any more. 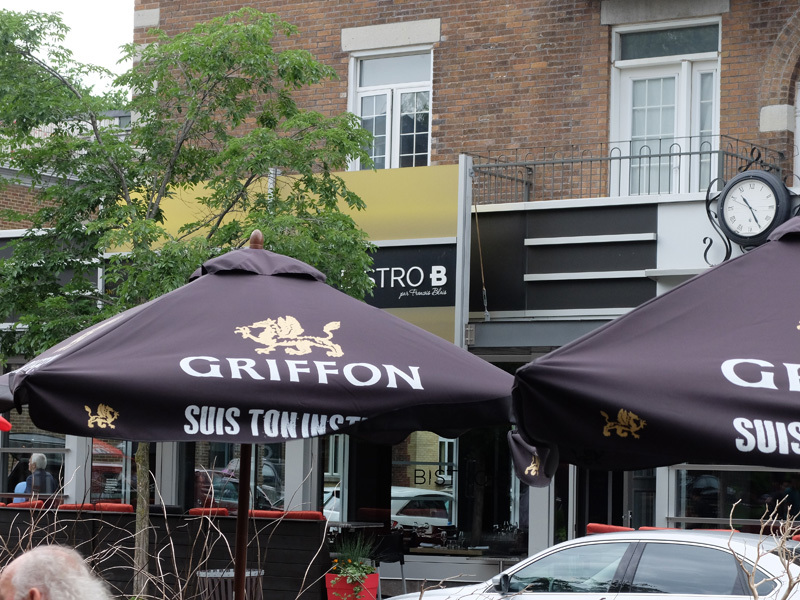 We found a lovely restaurant, Café Kreighoff, with a big awning over the outdoor seating area to protect us from the drizzle and enjoyed a French Rosé, Fish and Chips for Jeff and Beef Tartare for Joyce. 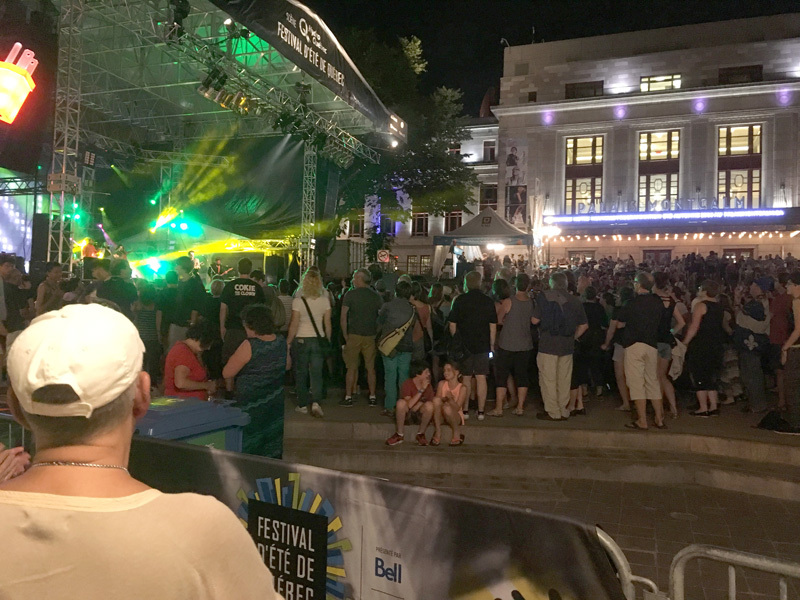 The café was on Avenue Cartier, which was an area bustling with cafés, bars, shops, etc., and was an event site for the Festival d’Ete de Quebec (FEQ). We watched acrobats, jugglers and other assorted actors perform in the closed off street while we ate. 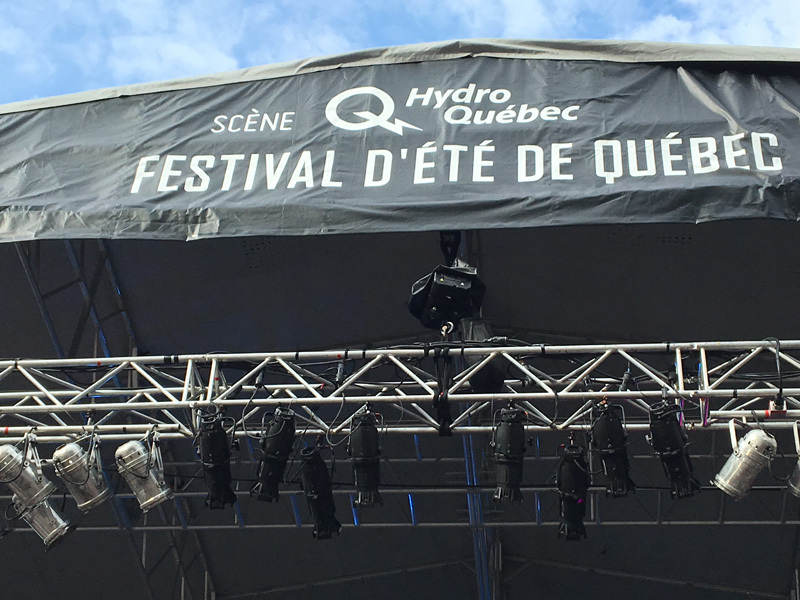 The FEQ is held every July and takes over quite a few venues in the city. 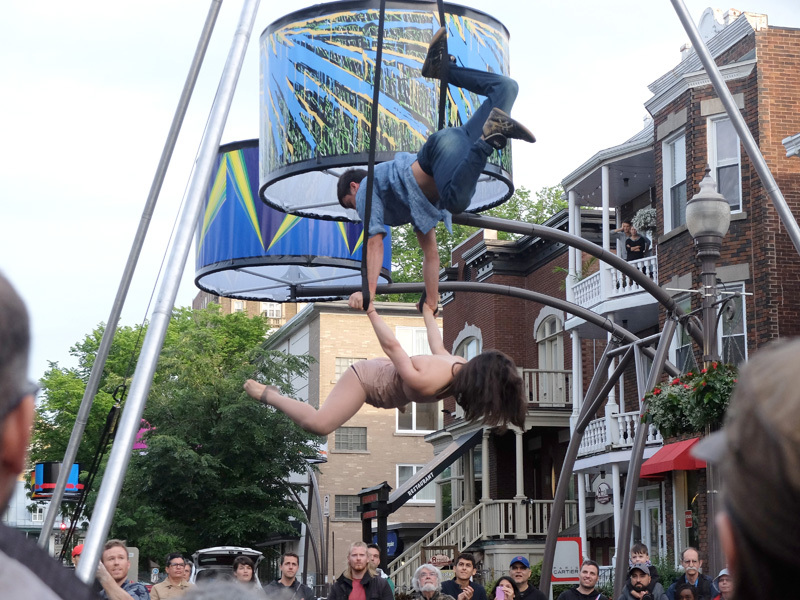 According to the website, they had 300 shows on 10 stages with live music every day for 11 days, and there were additional locations like Avenue Cartier where smaller acts and events were scheduled. The whole city was having a huge party that included performances by some pretty famous groups. The biggest current names we saw on the schedule were Sting and Selena Gomez, but they also had groups that were once big like: Sheryl Crow, Brad Paisley, Red Hot Chili Peppers, George Thorogood, Big Bad Voovoo Daddy, etc., etc., etc. Unfortunately, it cost $100 to get a pass to enter the bigger stage areas where the big names played. Fortunately, several of the stage areas were free admission and we took advantage of those to enjoy some great live music. We ventured back out after dinner and found an old-world pub decorated with old movie themes called Jules and Jim. “Jules and Jim” is the name of a French movie from 1962 that was a big hit in the French speaking world and that obviously inspired the owners of this bar. It had cozy padded benches and coffee tables set in conversation style which made for a comfortable setting. There was a shelf with books written in French labelled as a ‘take one, leave one’ resource. Jeff read excerpts from a few to Joyce but didn’t find one he wanted to take. 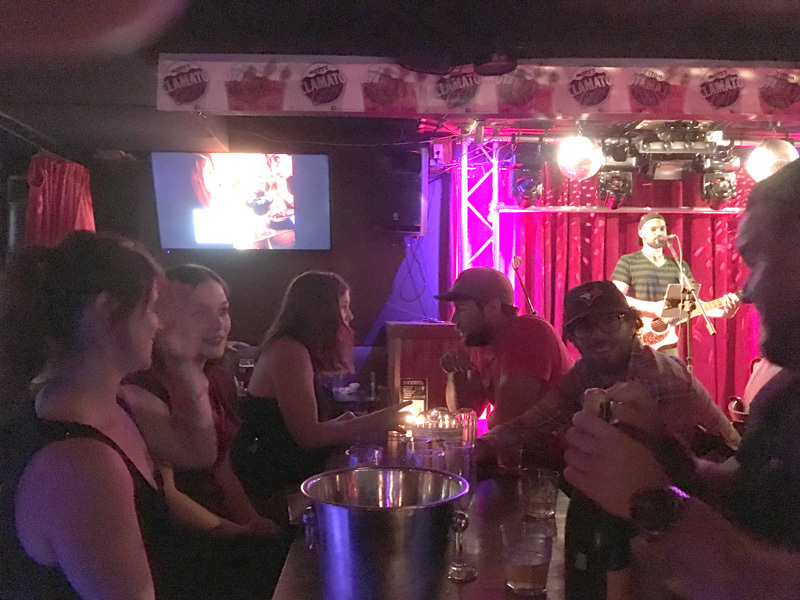 After a couple of drinks, we left the bar we discovered another restaurant/pub, Rideau Ridge, that had live music. 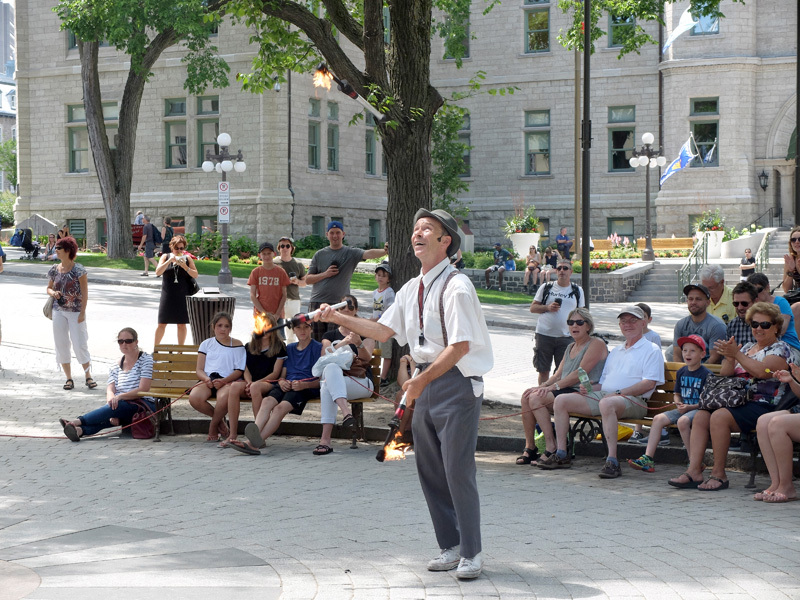 The Rouge band offered a variety of music in French as well as some songs in English. We enjoyed watching the crowd sing every word of every song!! They must have brought a busload of their groupies. And this was happening on a night when everyone could have gone to one of the big FEQ stages to hear bigger bands. It was a little after midnight before we got back to the room. Rosie heard us come in and wanted to know all about our adventures. She talked to us while we were brushing our teeth. Then Rosie wished us a bon soir (good-night) and happy adventures for tomorrow. It was like being tucked into bed. Sweet dreams. The day began with some very light drizzle that was supposed to clear up quickly. We walked to a Tim Horton’s for some coffee and tea, but Joyce’s French was not so good so we ended up with 2 coffees. The coffee mistake was quickly swapped out for a tea. We also had a TimMatin breakfast sandwich (think Egg McMuffin). Several breakfast items where TimMatin this or TimMatin that, matin being the French word for ‘morning’. Kinda clever, I guess. If you say Tim Horton with a French accent it sounds like Tim-aw-ten and that’s not much of a stretch from TimMatin, maybe? OK, maybe not! 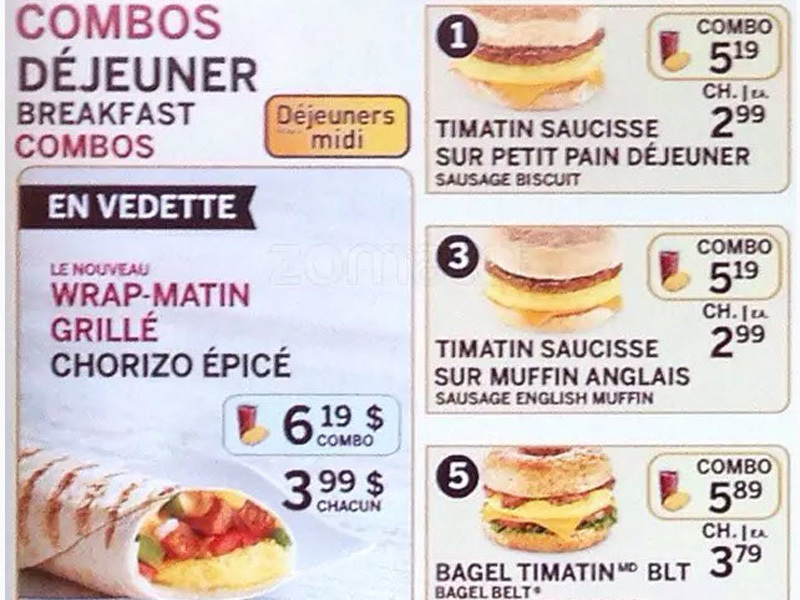 Tim Horton TiMatin menu items. 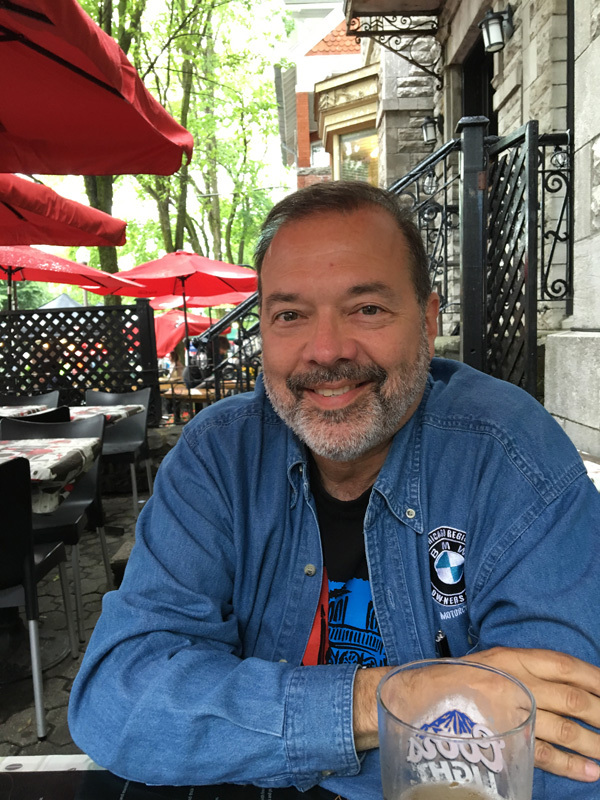 After we finished our breakfast, we walked down Rue Saint-Jean to the big stone wall surrounding the old city and the beginning of Vieux Quebec (Old Quebec). Rue Saint-Jean is a pretty long stretch of road lined with lots and lots of shops. 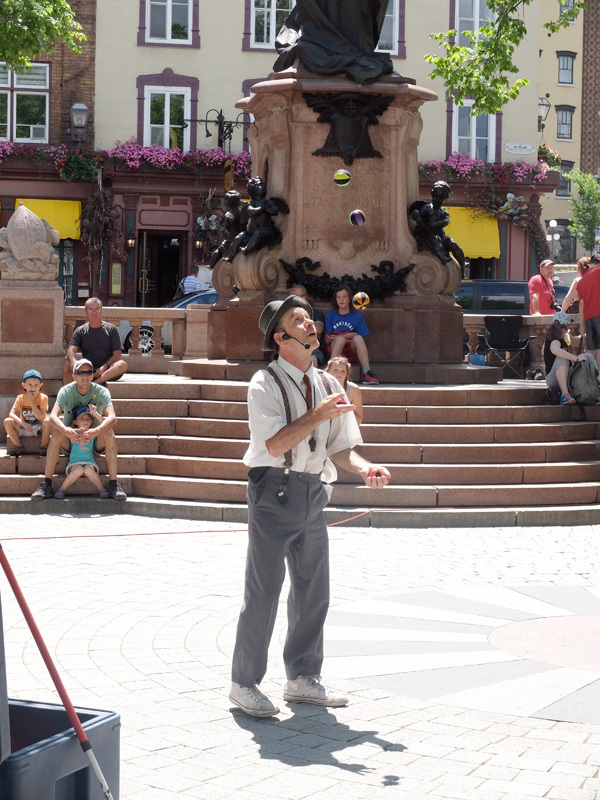 It runs all the way across Old Quebec and continues as a major shopping street for a long way beyond the wall. A pretty pleasant way to walk to Old Quebec. Once inside the walls, we toured the old city. There were shops, libraries (French for book stores) and bars - something for everyone! An ornate old church on the way to Old Quebec. 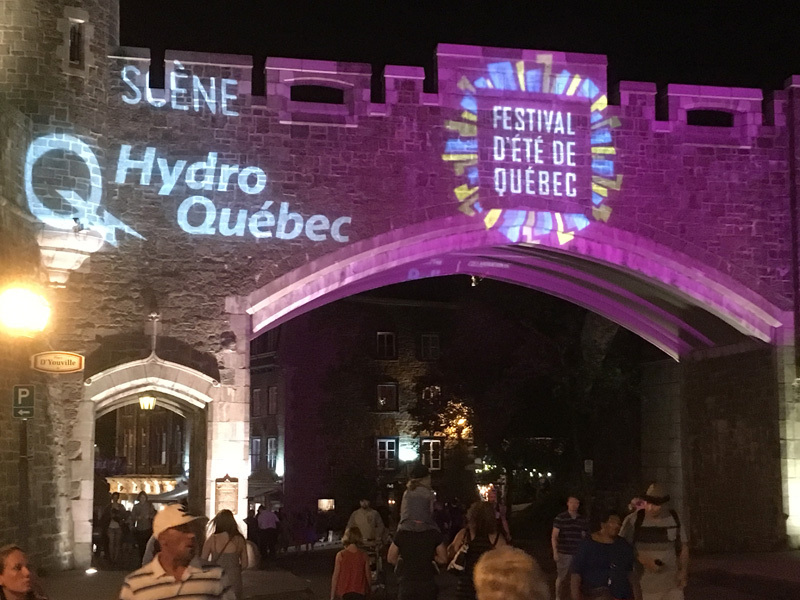 One of the big stone walled gateways into Old Quebec. 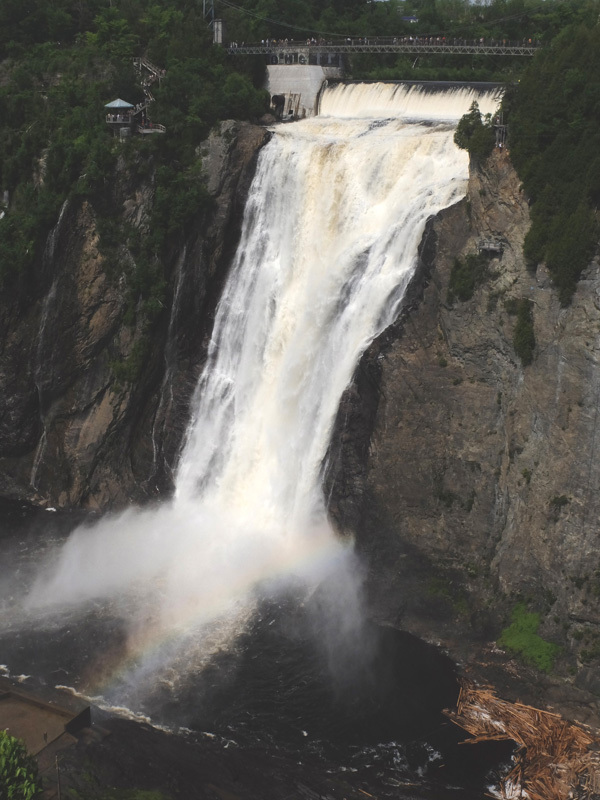 Quebec was founded by Samuel Champlain in 1608 making it one of the oldest cities in North America. A massive stone wall that exists to this day was built completely around the city and it is now the only walled city North of Mexico. 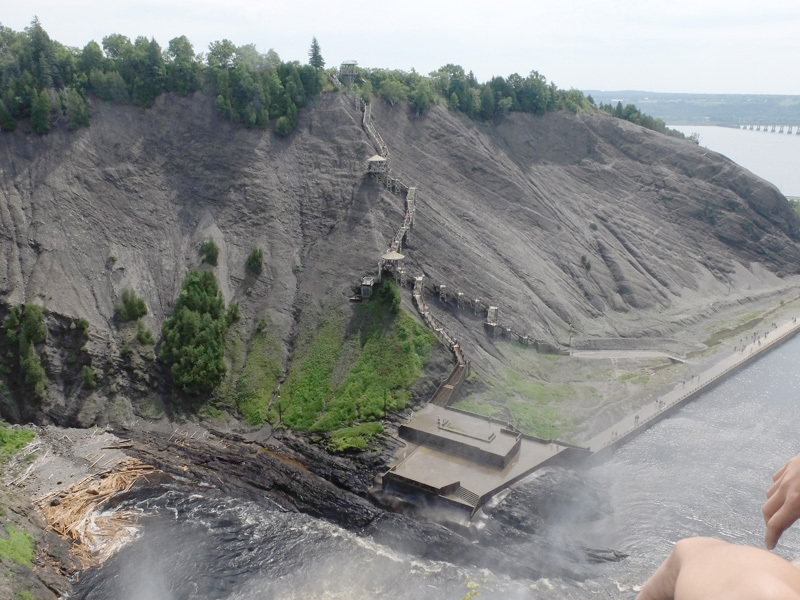 Near the St. Lawrence River the land rises steeply to a plateau that is about 60 feet above the lower land area. The high land made for a natural defensive position so that is where the walls were built. 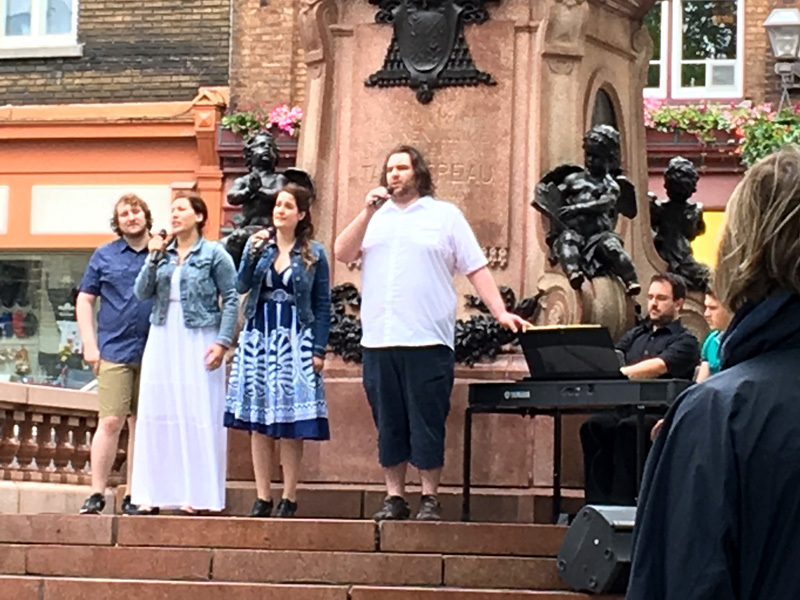 The first street performers we happened upon were singing operatic type songs. 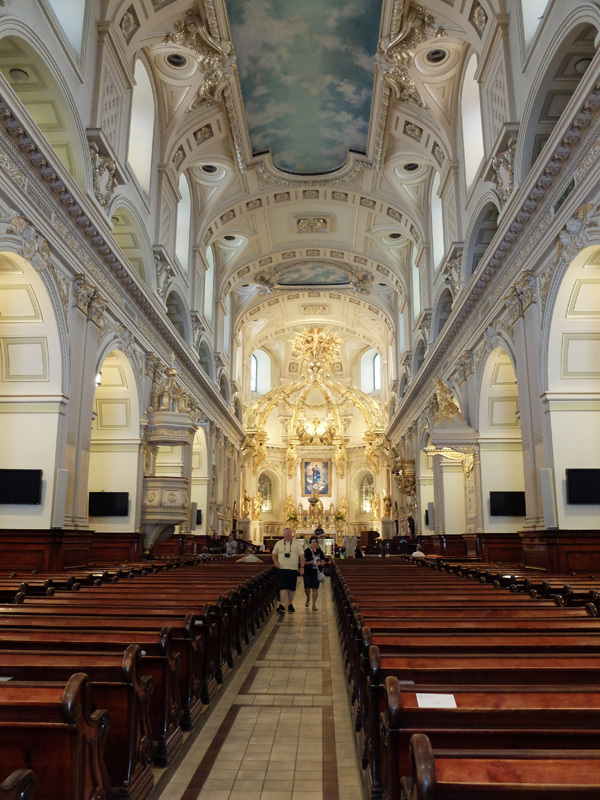 Holy Trinity Catherdral in Old Quebec. 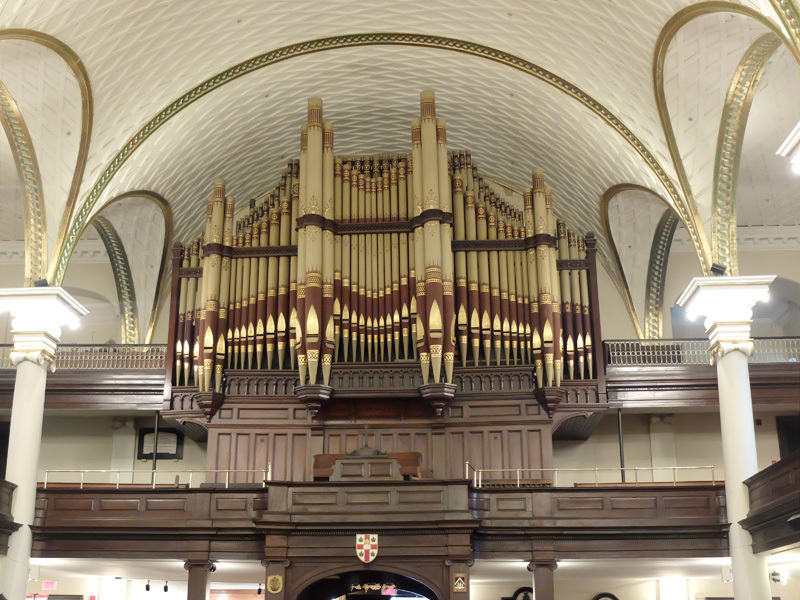 Holy Trinity Cathedral pipe organ. 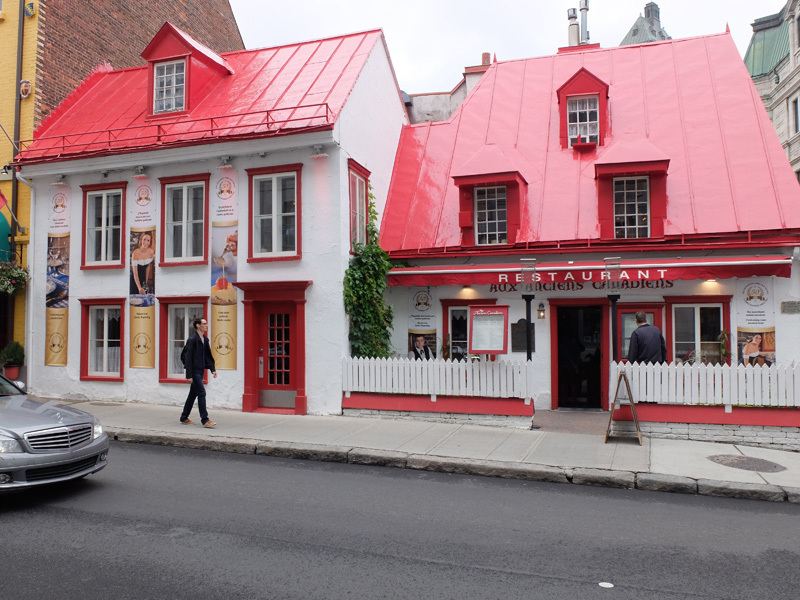 We had lunch at the oldest restaurant in Quebec City, Aux Anciens Canadiens. They gave us only a prix fixe menu so we asked for a regular menu. It turned out that the prix fixe was a lot less than dining la carte so we stayed with it. 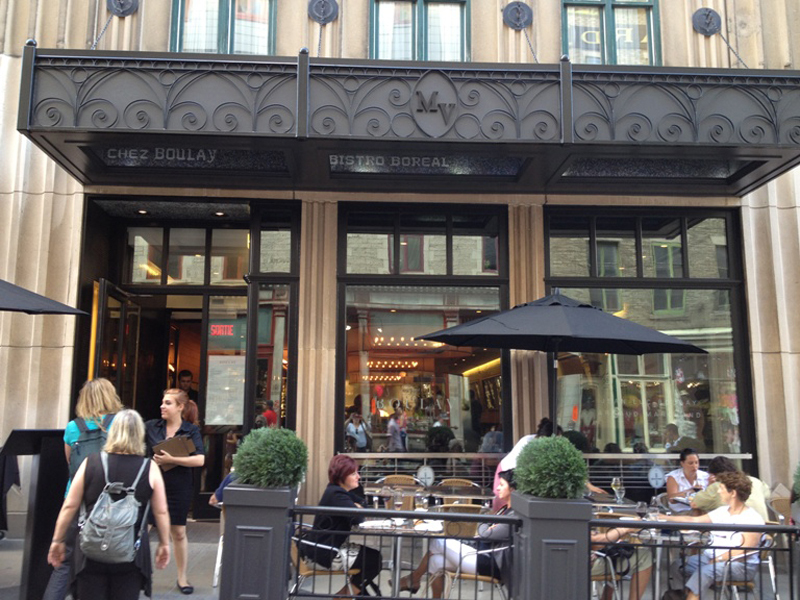 On prix fixe you get a glass of wine, a starter, an entrée and a dessert for a fixed price (‘prix fixe’ in French). Jeff had been wanting poutine since we got here and ordered some. Poutine is comfort food; fries covered with brown gravy and cheese curds. Joyce had ‘Soupe aux pois Grand-mere’ (Grandmas pea soup) which was also pretty tasty. Those were the starters. After our entrees we really didn’t want dessert, but its prix fixe so we forced ourselves to have some pear sorbet, which was actually very good. We walked toward the river and decided to explore Lower Town. 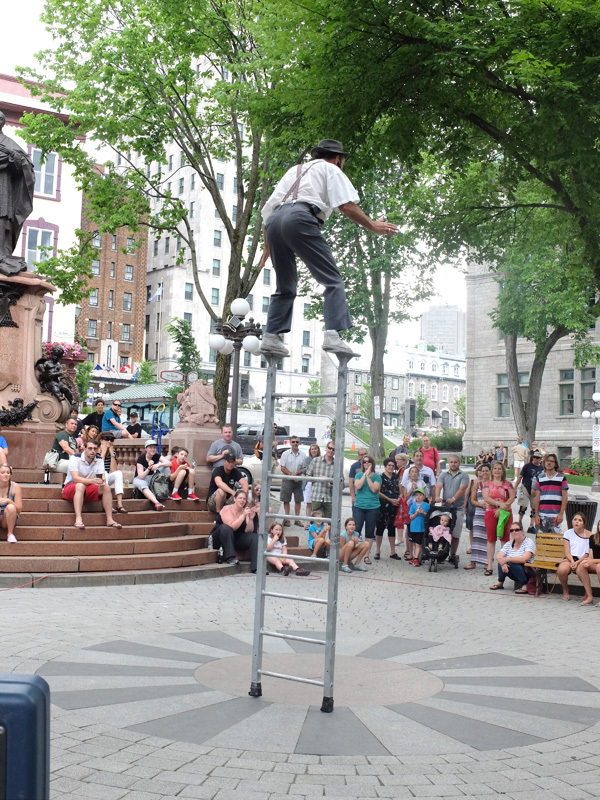 The walled-in area of Old Quebec is on a bluff that rises a good distance above Lower Town and you can use the nearby L’Escalier Casse-Cou (Breakneck Steps) or take the Funiculaire, a sort of a ski lift up the cliff. 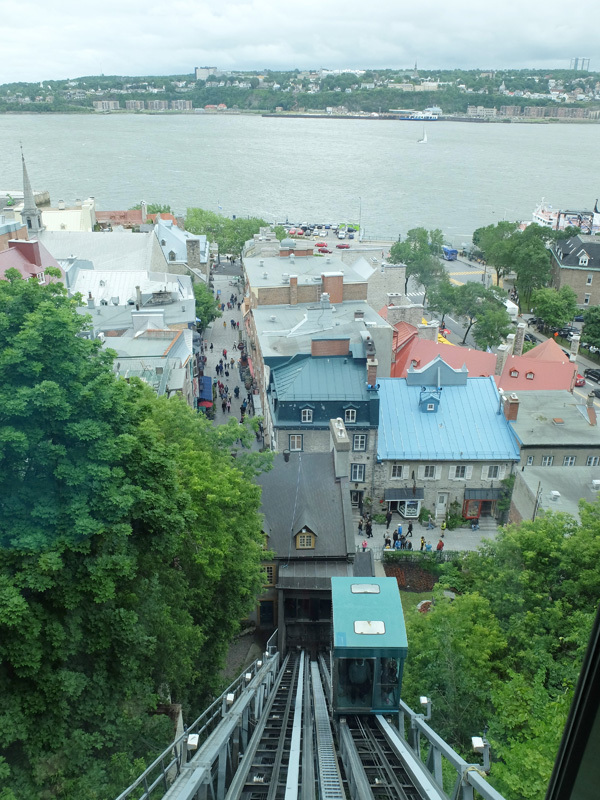 The Funiculaire and a view of the Saint Lawrence River. 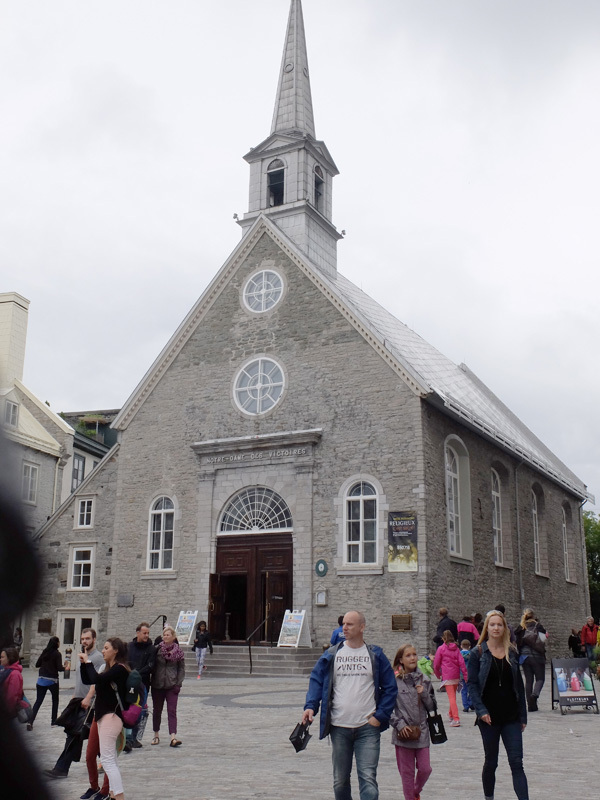 We explored Lower Town and visited the Notre-Dame-des-Victoires church, the oldest stone church in North America. 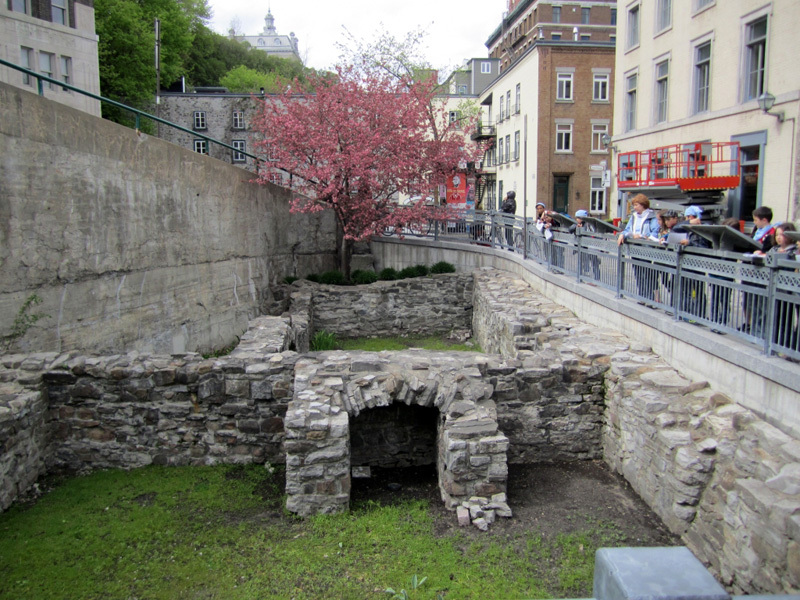 We saw the famous Quebec fresco and the ruins of where some of the first houses in this area once stood, You can see what remains of the foundations of two houses: those of Guillaume Gaillard and Jean Soulard. Notre Dame des Victoires facade. 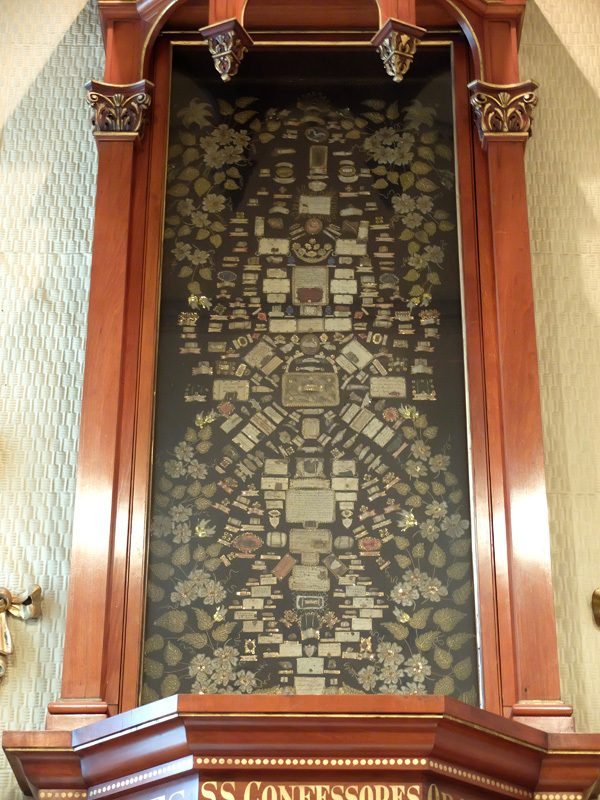 Notre Dame des Victoires altar. 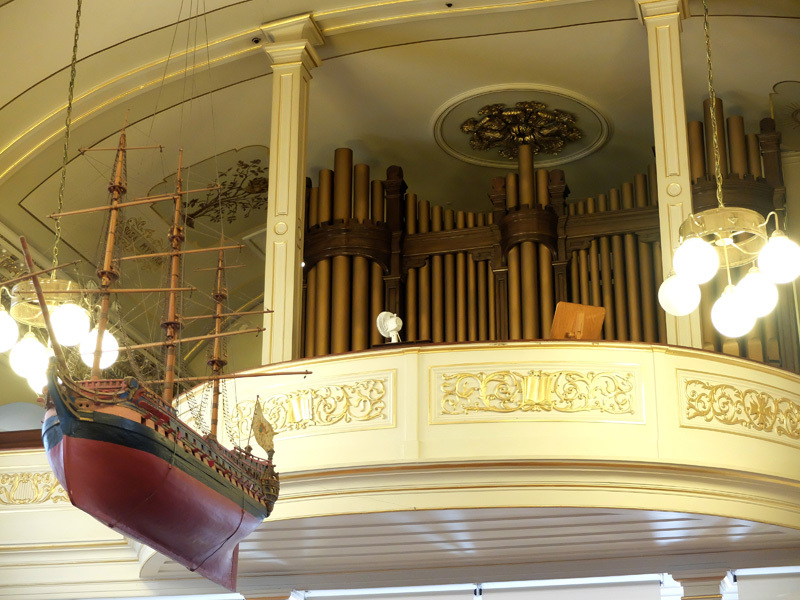 A ship sailing in front of the Notre Dame des Victoires pipe organ. 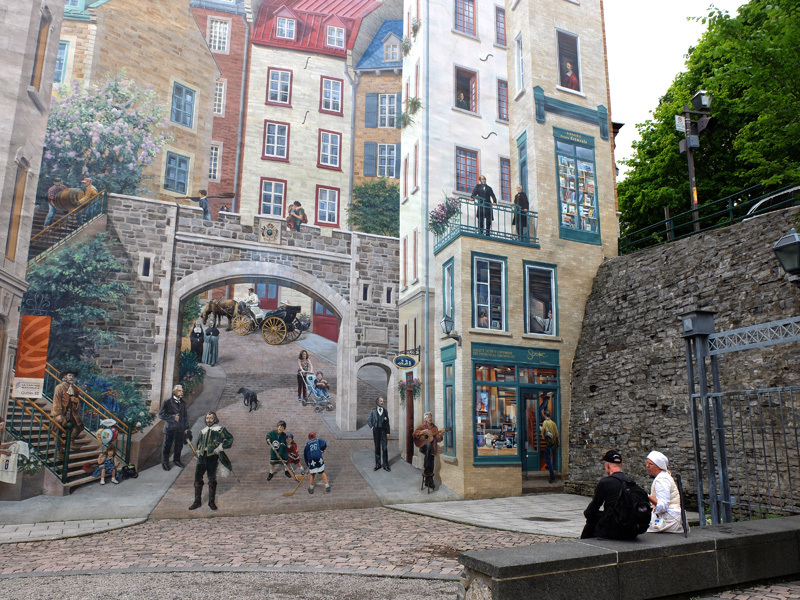 Huge fresco in Quebec City. Foundations of Gaillard and Soulard houses. After exploring Lower Town, we walked up a very steep hill to La Citadelle (The Citadel) which is a military fortress with its own big stone wall surrounding it. 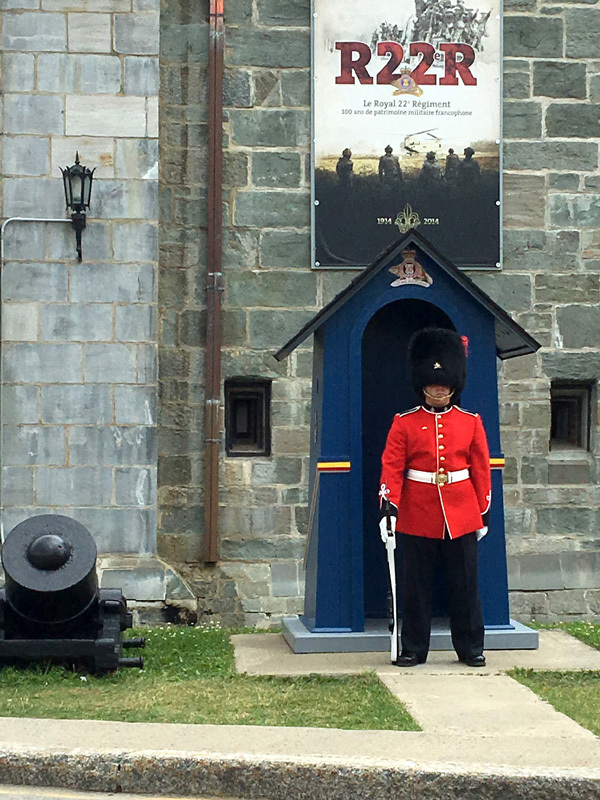 It’s still an active military base for the Royal 22nd Regiment but is used primarily for ceremonial purposes so they allow visitors to take guided tours of the premises. We signed up for a tour and, of course, the cloudy skies decided to show us some drizzle that turned into a little heavier rain by the time the tour was ending. The rain wasn’t too bad and we had our umbrellas, but the winds at the top of the high bluffs that the Citadel sits on were blowing pretty hard and turning some people’s umbrellas inside out. 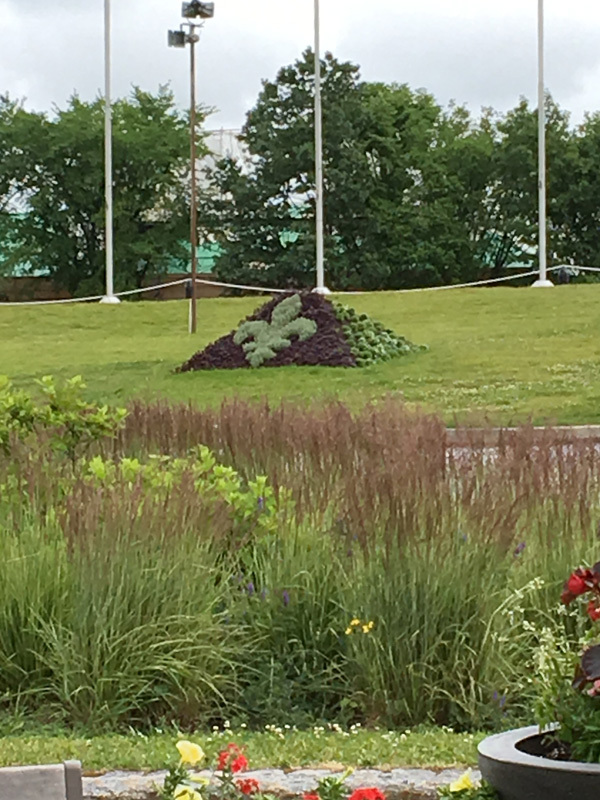 Landscape feature with a fleur-de-lis. 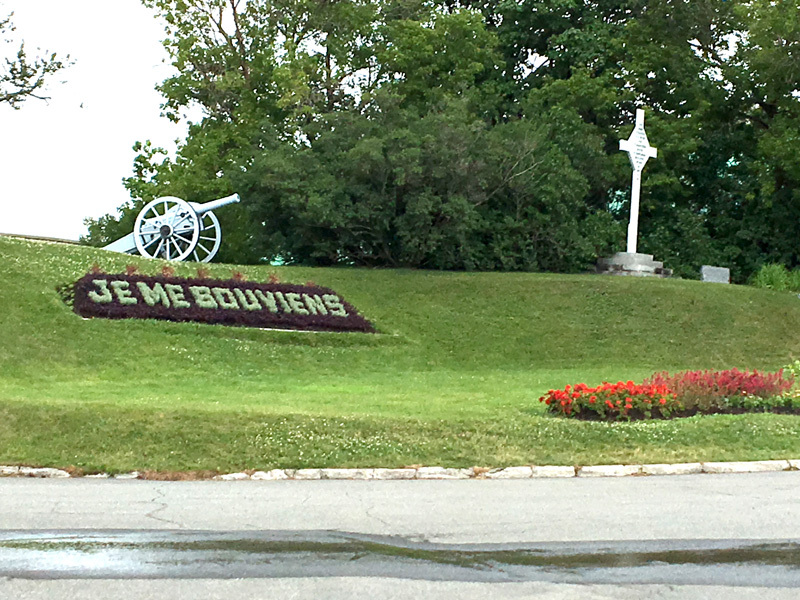 Motto of the Regiment is 'Je me Souviens' (I will remember). 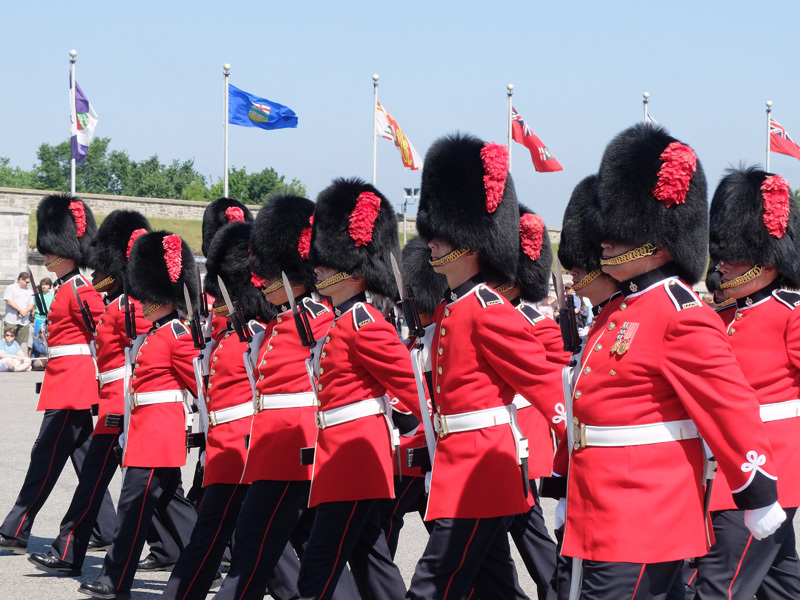 With a ticket for a tour you are allowed to watch the changing of the guard, but that happens at 10:00am each day unless it’s raining (Can’t get the uniforms wet, you know). We can come back tomorrow if it is not raining and see the changing of the guard then. Finally we were ready to sit and enjoy a beer. 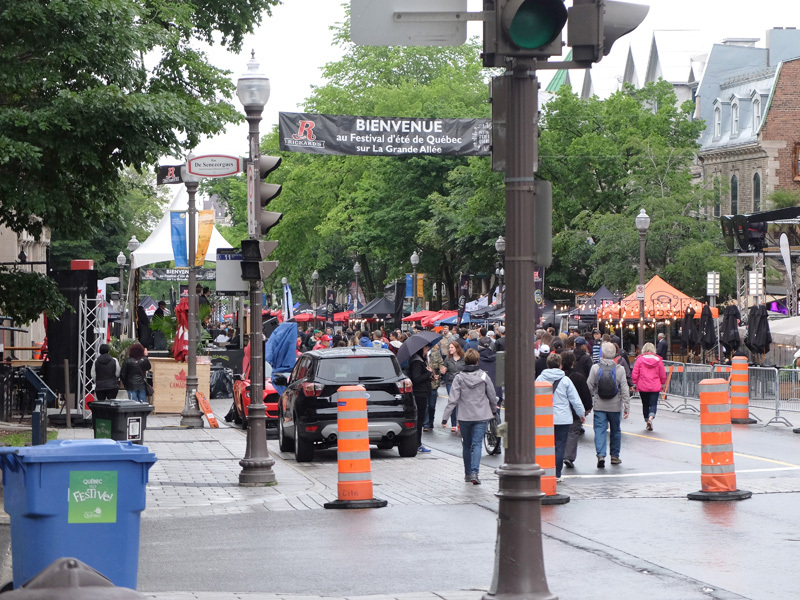 It was still drizzling and a little cool and we made our way back toward the flat and Avenue Cartier where clowns, acrobats, and magicians were performing again. We found a nearby bistro, Bistro B, and enjoyed the best meal since we arrived (yes, its only our second dinner, but just saying); foie gras for appetizer then duck breast for Jeff and cured beef for Joyce and just when it could not get any better, we had a gourmet cheese plate for dessert. Amazing. We walked some more after dinner. It was Sunday evening and the shops closed up early. It stopped raining and was not as cool. A beautiful night for walking. About 10:30p we got back to the room, brushed our teeth, put in the earplugs and settled in for the night with an open window and a ceiling fan; perfect for sleeping. Closed streets full of wet festival goers. Safe from the rain under umbrellas. Lots of police presence. Jeff after a long day and a cold beer. We were up and out about 8:30am. Beautiful temperature and sunny! We headed for the Citadel for the changing of the guard. Quite an impressive ceremony; it lasted about an hour. There was a band and their Chashmere goat mascot named Batisse was in attendance. Very impressive! 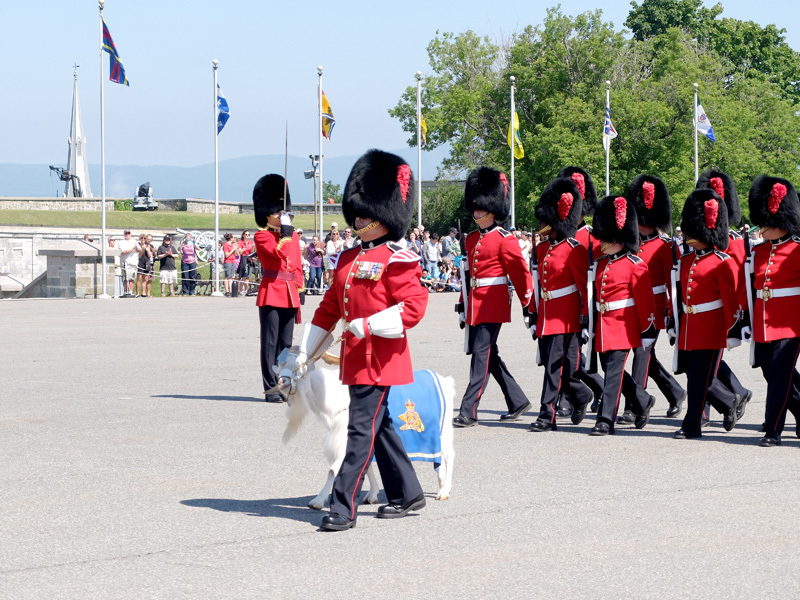 The goat was presented to the regiment in 1955 by Queen Elizabeth II. Obviously that’s a long time ago and the original goat was stuffed and is on display in the Citadel. His descendants, all named Batisse, continue the tradition. 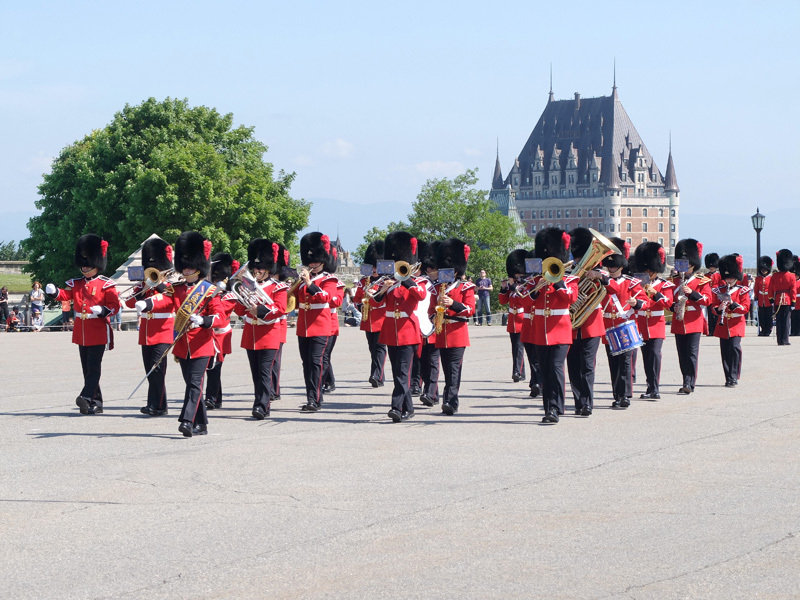 Changing of the guard band with the famous Chateau Frontenac hotel in the background. Batisse and his goat handler. Next we visited the museum at the Parc de l’Artillerie (Artillery Park) that had a 1:300 scale model of Quebec built in 1806 showing exactly what buildings, etc., where there at that time. It was constructed to take to the king to try to convince him to provide more money for its further development. The museum pass included access to the Dauphine Redoubt, which housed men, officers, ammunition, etc. 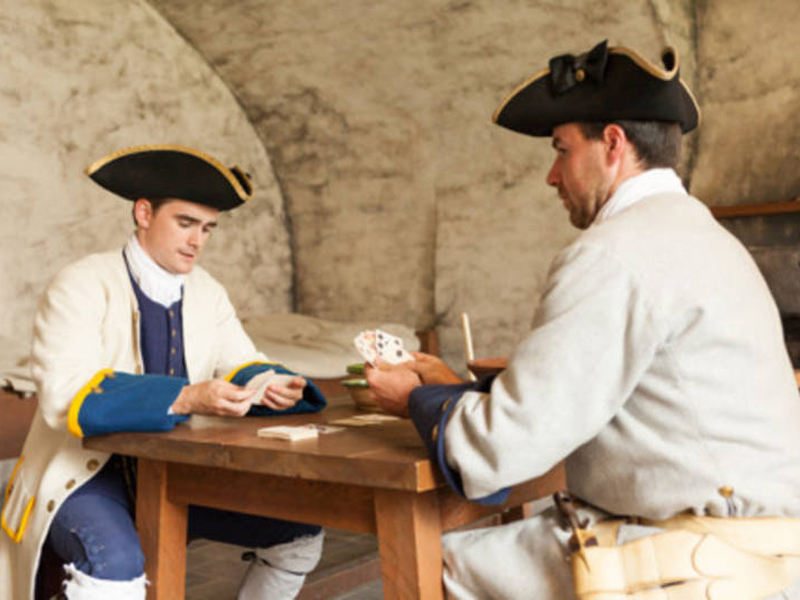 Several actors dressed in period apparel were placed throughout the Redoubt to explain different areas in the building. Period Actors in the Redoubt. After that we walked around some more of the old city. We stopped for lunch at a corner restaurant, Le Chic Shack, with a beautiful view of the Chateau Frontenac, a massive and massively impressive luxury hotel that is supposedly the most photographed hotel in the world. It has over 600 rooms on 18 floors and was built by the Canadian Pacific Railroad around 1893. 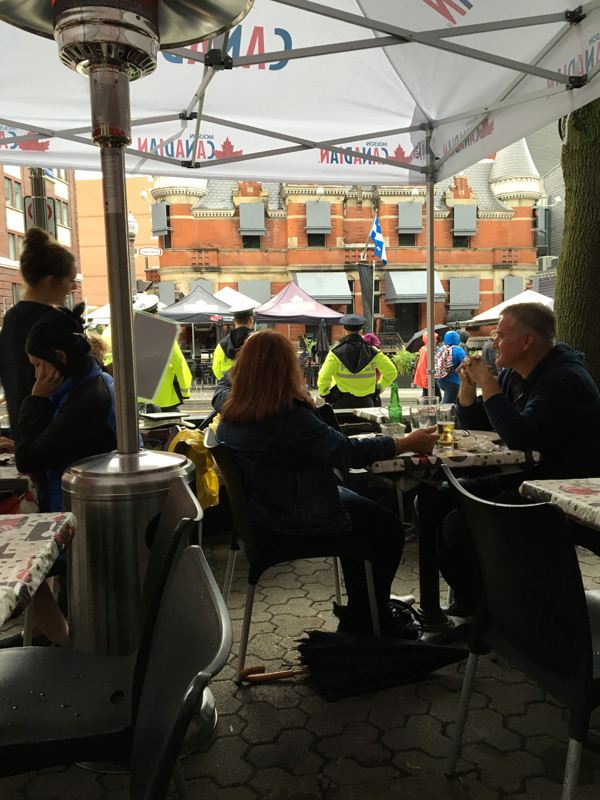 While relaxing at Le Chic Shack, we enjoyed watching a street mime, horse drawn carriages, and tour buses picking up and dropping off tourists (including buses to shuttle people to and from the Chutes de Montmorency which will play a role in our adventures further down the page). We had Chef Salads and a cold beer and a locally produced alcoholic apple cider. Ah! After lunch we walked out to an open area where performers where starting their show. 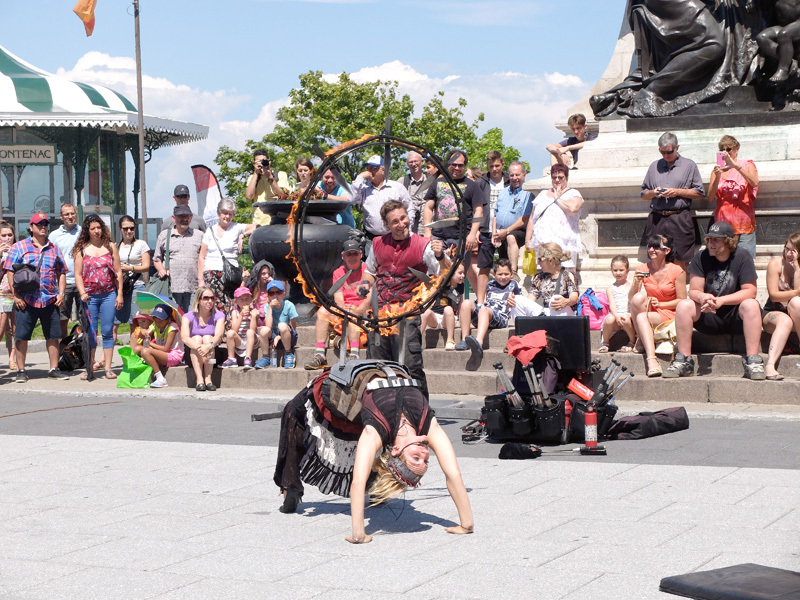 The man and woman juggled knives and flaming batons and even juggled on stilts. They were very good. At one point they pulled people from the audience to participate and Jeff was chosen to stand up there for a whole and eventually throw a flaming baton toward the man who, as you would expect, caught it perfectly. Of course, Jeff threw it perfectly too. 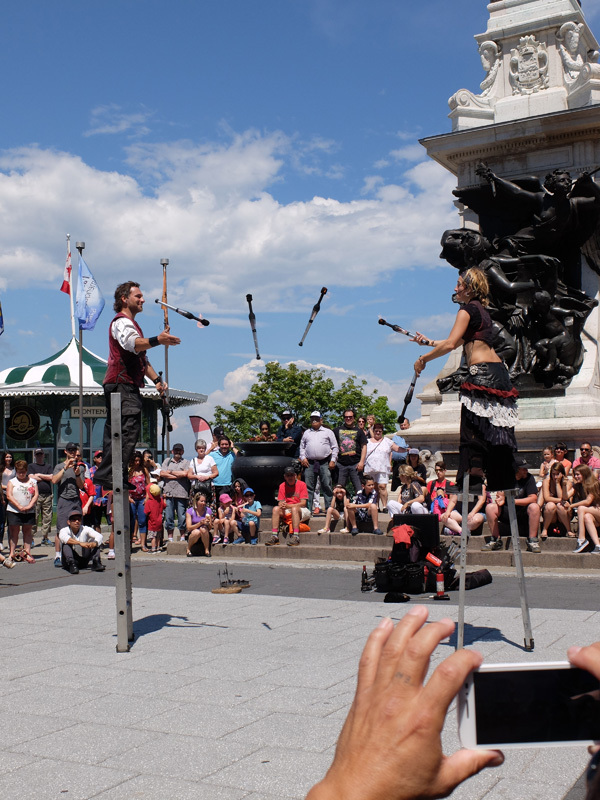 Juggling flaming batons on stilts. Jumping through a flaming ring with knives. He made it too. Jeff shows them how its done. Notice the entrance to the Funiculaire at the far right. We were off again after lunch, it was 80 and sunny with a nice breeze. We decided we wanted to bring some wine, cheese, and bread to enjoy while watching one of the FEQ bands after dinner so, wanting to be discrete, we made an adventure of looking for disposable cups to drink the wine from and found a couple of coffee cups we were welcome to take at a coffee service shelf in a small convenience store. We stopped at a cheese shop and bought some of the delicious cheese we had at Bistro B called ‘14 Arpents’, and a half baguette (never knew you could buy just a half). Now we were in search of something to use to cut the bread and spread the cheese. We stopped at the ‘Metro’, a grocery store with lots of other merchandise, and found a package of 4 pairing knives for $3.00. All we needed now was a bottle of wine. We walked some more and found a bookstore selling books, many of which were written in French. 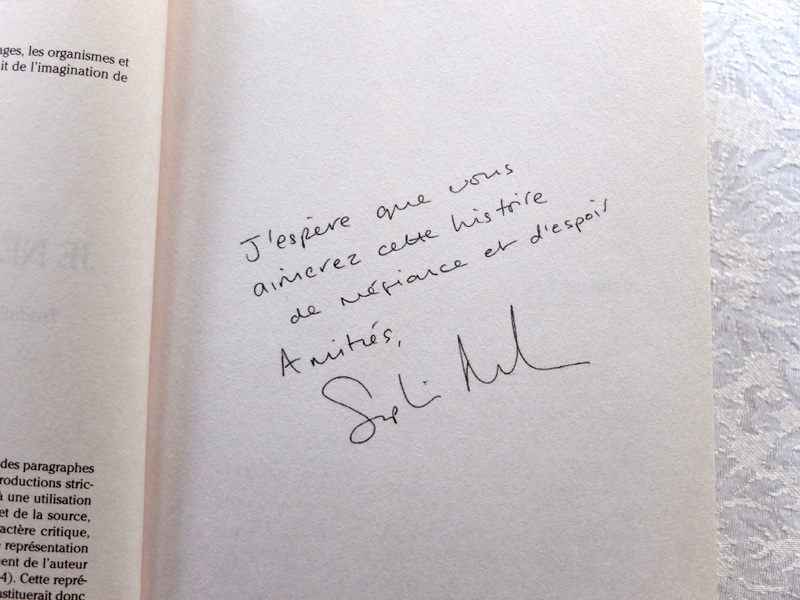 Jeff found a nice souvenir, a book signed by the author, Sophie McKenzie, entitled Je ne t’oublierai pas (I won’t forget you). A couple of shops later Joyce found and bought a cute dress. Signed book message is 'I hope that you like this story of distrust and hope'. We got back to the room, emptied our backpack, changed clothes, and repacked the backpack with the bread and cheese. We went to dinner at restaurant near the flat, Le 47e Parallele (47th Parallel) and enjoyed a delicious meal of veal medallions for Jeff and, of course, steak tartare for Joyce. A couple of doors down from the restaurant was a Marché (market) where we got a lovely bottle of French Rosé and a corkscrew. We were set! We walked down to where one of the stages was and found a bench to sit on in a small park in front of the Parliament building (forgot to mention earlier that Quebec City is the capital of the Provence of Quebec). We could easily see the stage from our bench. We enjoyed the night, the music, the wine, the cheese, the baguette, and each other’s company. After the last band finished we saw a huge Jumbotron next to the stage had started showing another concert. We moved closer and sat on the wall at the front of the park and enjoyed more music for a while longer. We begin to get sleepy and headed back to the room and turned in for the night. It was overcast this morning but temps were supposed to reach 80 by the afternoon. We found a charming café and had our coffee and tea. We shared a huge plate of eggs, potatoes, toast, fruit and cheese. Guess we’ll skip lunch. We walked into the old city and eventually stopped at the Marché Du Vieux Port (Market of the Old Port) which as you might guess was near the boat ports, an indoor farmer’s market. They had beautiful local produce, cheeses, seafood, and pastries. 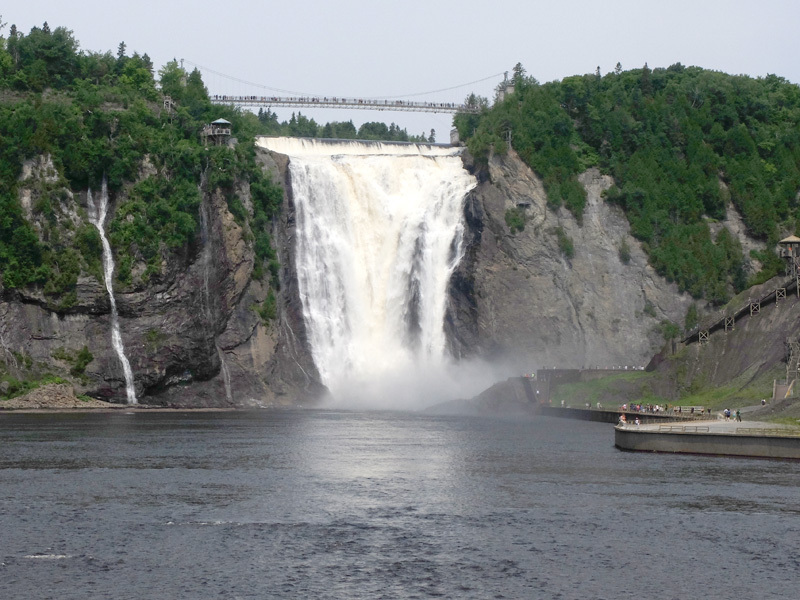 After browsing for a while, Jeff called an Uber car and we got a ride to the Chutes de Montmorency, a waterfall about 12 kilometers away. Oh! My! It was breathtaking. It’s 30 meters higher than Niagara Falls but not nearly as wide. 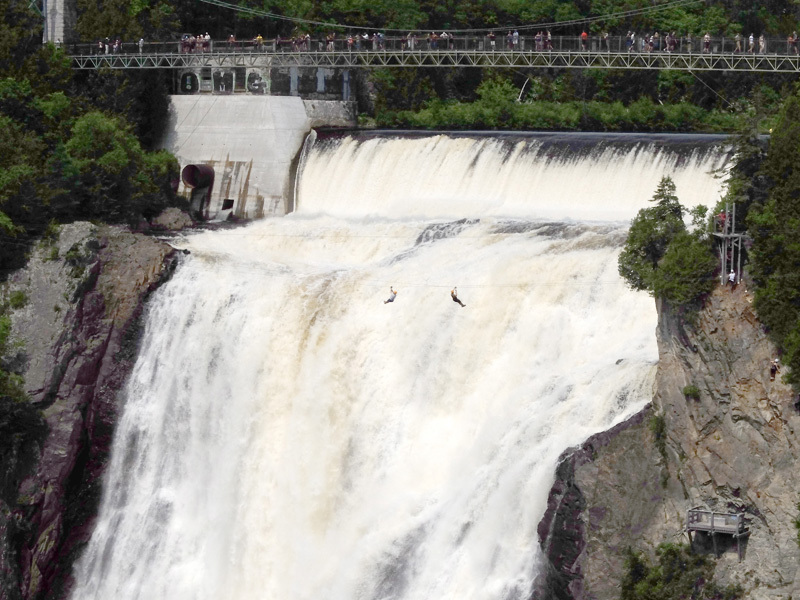 You can zip line over the falls if you wish (we didn’t). 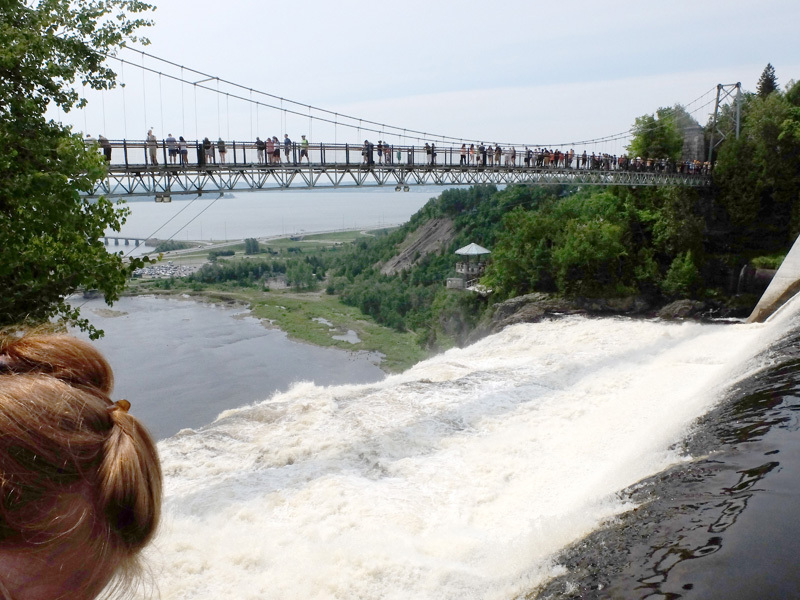 There’s a bridge that spans across the falls also. We hiked across the bridge and followed a short trail to a descending stairway with 487 steps leading down to the bottom of the falls. We took our time and were happy we started our hike at the top instead of climbing up the stairs! At the bottom of the falls a rainbow was dancing in the waterfall mist! A wonderful sight to behold. You could still feel the mist from the falls quite a ways away!! Bridge across the top of the falls. Zip lining over the falls. The 487 steps up the cliff. Rainbow in the mist near the bottom of the falls. When we were ready to leave the Uber app showed no cars available. Uhoh. We saw a bus getting ready to leave the falls area heading back to Quebec City. Jeff asked if we could but a ticket for a ride. We were told you can only purchase tickets where you get on the bus in Quebec City. Really!? We were stranded at the falls wondering how in the world we are going to get back. Jeff decided to ask people leaving if we could catch a ride with them. After several asks and rejections, we found a lovely couple returning to QC who were willing to give us a ride. We discovered they were from Paris and live not far from the flat we rented when we went to Paris last year. They were returning to QC where they were visiting on vacation. We had a nice chat on the drive and Jeff offered them some money for helping us out. They refused any compensation stating they were happy to be able to come to our rescue!! Thank you so much you are God-sent Parisian Angels! We started heading back to the flat and decided to sit and relax a bit so we stopped at a café called the Hobbit and ordered a charcuterie and cheese plate. Yummy! Since we were here celebrating our 30 years of marriage we made reservations for dinner at a lovely, restaurant called the Chez Boulay. We had soup appetizers, pork loin and belly for Jeff and Goose and Duck for Joyce. The best meal since we arrived! It was 10pm when we are finished – we got back to the room and fell blissfully to sleep. Projections on an old Quebec gate near one of the stages. Band performing near the old Quebec gate. We were up and out at 8am again. 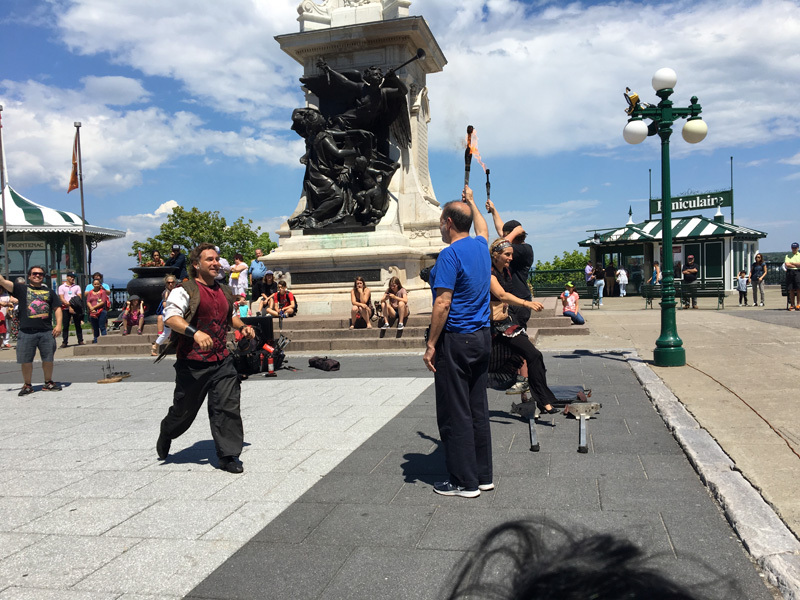 We walked in the opposite direction of Old Quebec and stopped at the Parc des Braves, which was one of the historic battle grounds for the city. From there we walked toward the St Lawrence River to the Plaines d’Abraham, where more of the historic battles took place. We traced part of the progress of the battle for Quebec City between the French and the British from where the British landed on the St. Lawrence River and eventually conquered Quebec City in September 1759. Fascinating piece of history. There is a museum complex on the Plaines d’Abraham. We had an hour to kill before the museé opened so we found a quiet bench overlooking the St. Lawrence River and relaxed. The museum complex consists of three building connected to a central pavilion that is the main entrance. 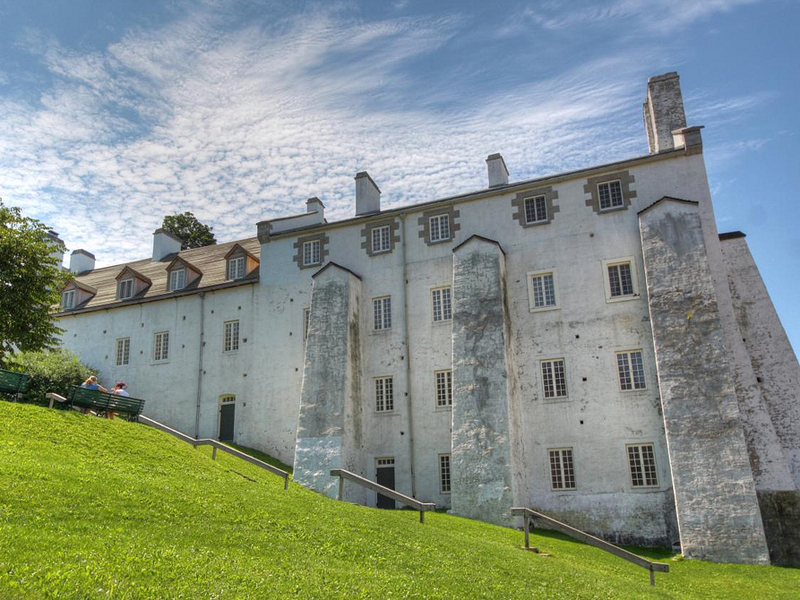 One of the buildings, Pavillon Gérard-Morisset, is the original art museum from about 1933. 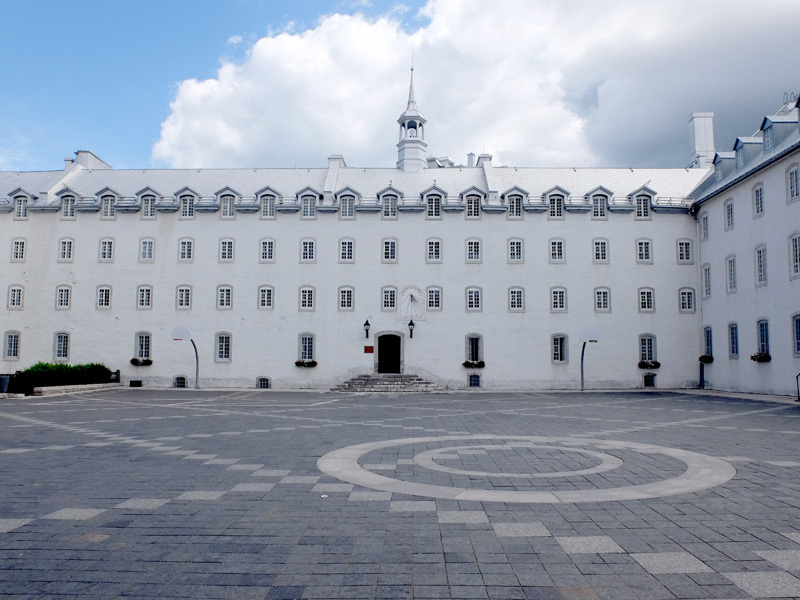 The second one, Pavillon Charles-Baillairgé is the old prison of Quebec City, dating from the 19th century that was converted to a museum. 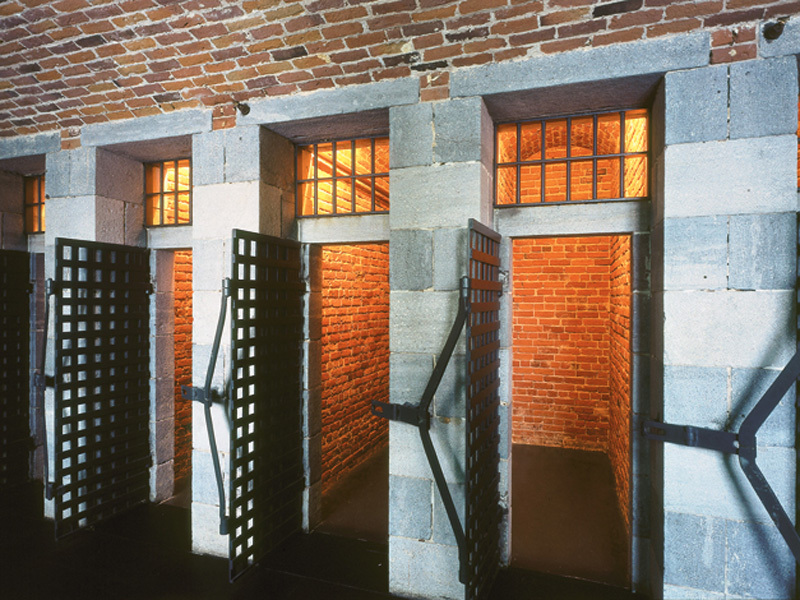 They’ve maintained several of the original cells to show what they looked like a hundred or more years ago; quite small. 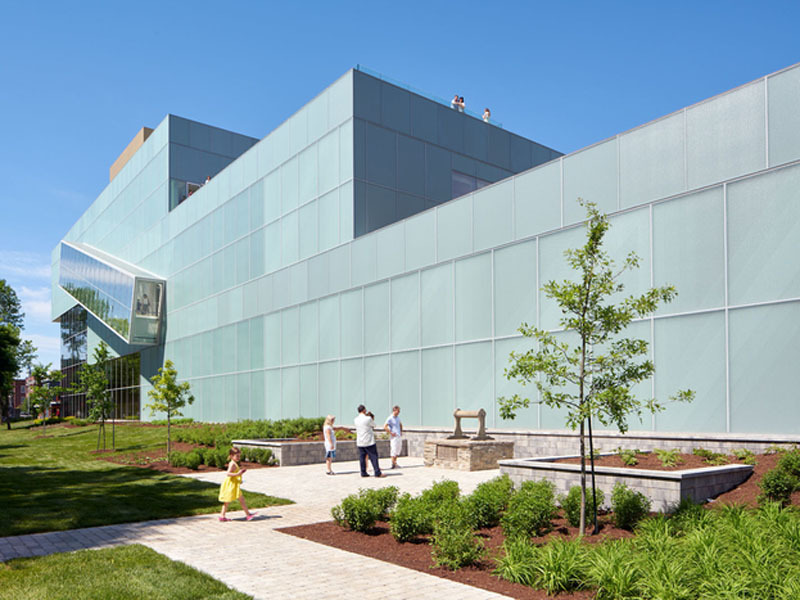 The third building, Pavillon Pierre Lassonde, was completed in 2016 and is a very beautiful modern structure. 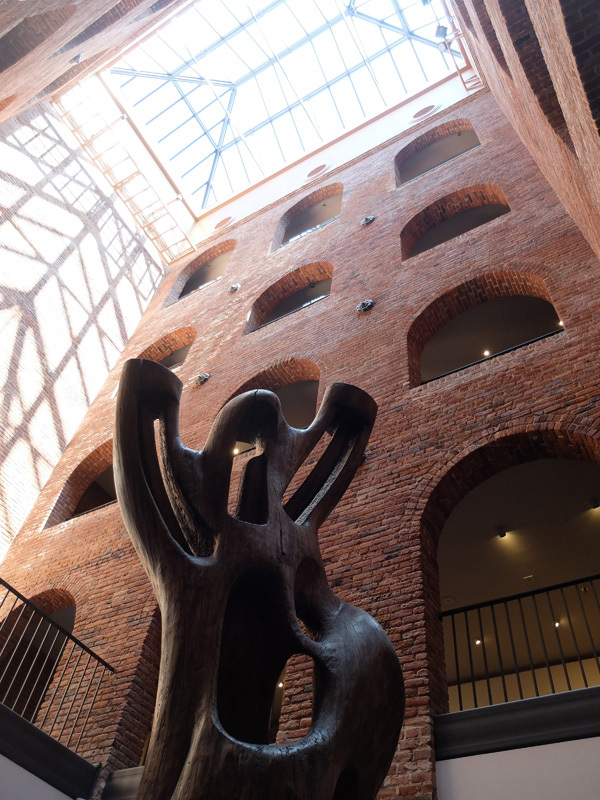 We toured the original section of the museum which was full of mostly modern art and some historic art. We toured that and the old prison section for an hour or so and then took an underground passage way to the newest art museum. We spend another hour or so looking at the art there then ventured out again. Art exhibit in the old prison building. The old prison courtyard is now covered with a skylight. Newest building is very modern with its unique cantilevered exterior stairway. Interesting interior stairways as well. 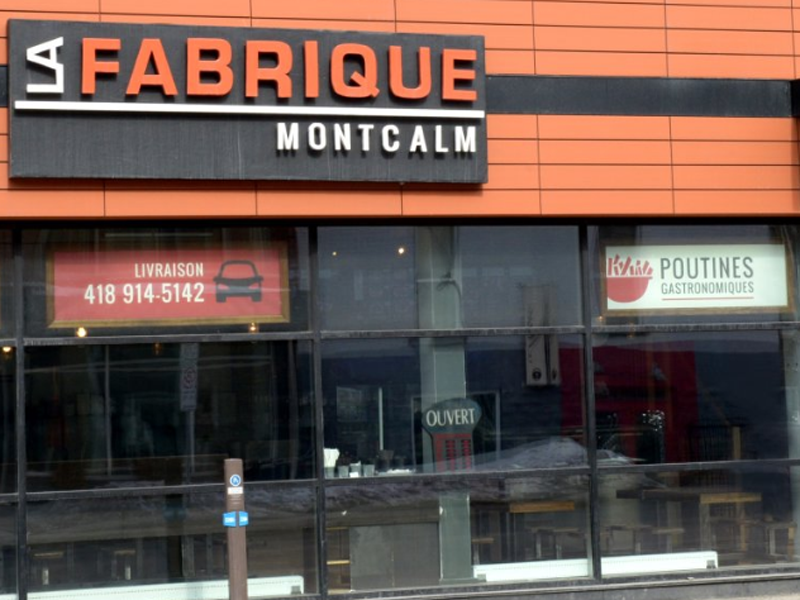 We went for lunch to La Fabrique Montcalm which advertised ‘Poutines Gastronomiques’. They had a framed news article hanging inside with a story about their creative poutine. How could we resist. It was pretty hot inside and there were only a few stools by the window so we walked to a park on the next corner and ate our gourmet poutine on a park bench. La Fabrique has gourmet poutine. We got back to the room, checked the weather, and searched the internet for other local interests. Joyce dozed off on the bed. (No surprise there). After a bit we walked toward the old city again and checked out more of the Plaines d’Abraham park. It’s quite massive at 242 acres. 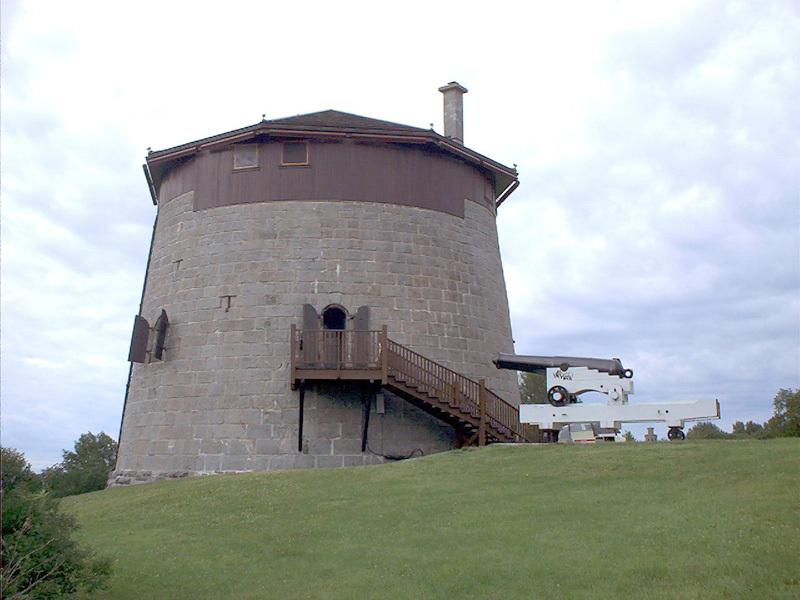 We stopped at one of the Martello towers (tower 1 of 4) that was open for tours, but they wanted something like $14 a person so we skipped it. The towers were designed to be forward bases of defense to stop or at least slow down an attacking army’s advance on the city. The walls were thicker away from the city facing the enemy and thinner on the side facing the city so gunners could destroy them if the enemy overtook them. There’s a museum offering tours of the Plaines d’Abraham grounds but since it was 80 and very humid we opted for an air conditioned building. The Chateau Frontenac will do. Beautiful vast lobby and they have free Wi-Fi, so we sat and relaxed for a short time until the bar opened at 4pm. The bar overlooks the St. Lawrence River where they were having sailboat races. So we sat and enjoyed watching a couple of huge catamarans sailing on the river. We met a delightful couple from West Virginia who asked if they could share two seats of the four-top we were occupying. After visiting with them for a while we ventured out again. 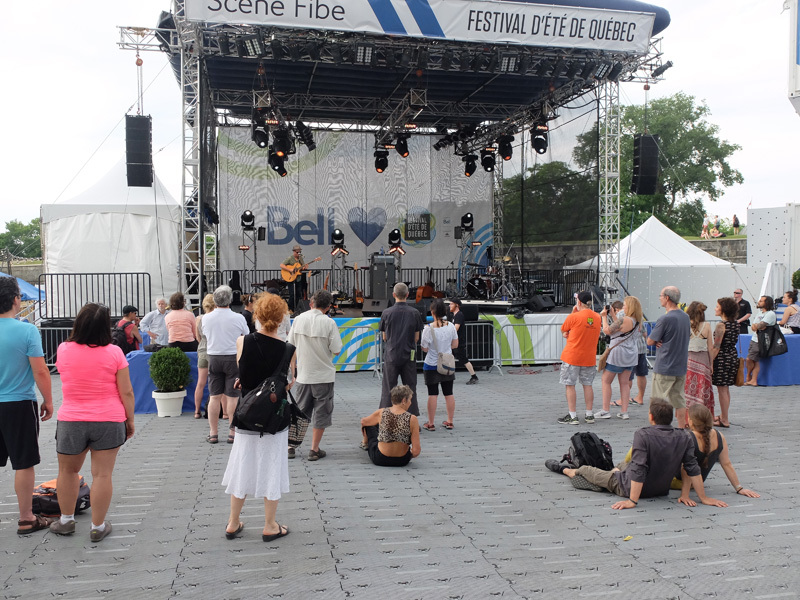 A band was playing at one of the FEQ stages so we stopped for a while to enjoy it. After the band finished its set we walked to the restaurant where we planned to have dinner, Le Cochon Dingue (The Crazy Pig), because Jeff thought he had read somewhere that they had smoked meats like pork and brisket. We had an almost personal concert several times. Another stage at the festival. On the way through the crowds to the restaurant there were two people dressed as Star Wars storm troopers in the midst of the blocked off street. Joyce got pretend captured. Hopefully a great picture for the grandkids to laugh at. Fortunately, Jeff convinced them to let her go. 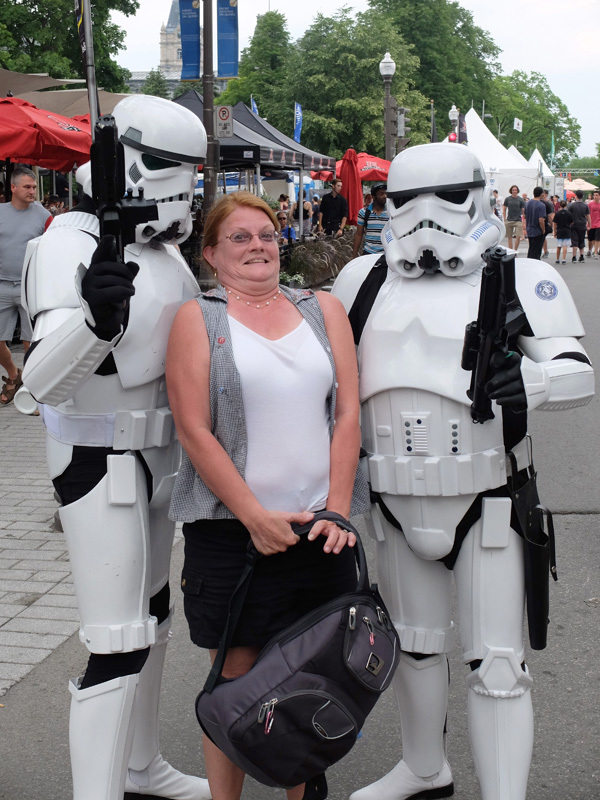 This is not the tourist you are looking for. At the restaurant we enjoyed a pork burger reminiscent of a McRibb sandwich. This was not the smoked pork we thought it was going to be and was probably the least exciting dinner we had. Not to say that it was bad, but we had had such amazingly more delicious food everywhere else we had eaten. Next we headed over to the Bistro B to get a cheese plate for dessert. It was 10pm when we finish so we headed back to the room and slept. It was a lovely morning. We were up early but dozed back off again; all the walking no doubt. We finally got out at 7:30a looking for coffee/tea. We found a coffee shop, Brasserie St-Jean, and enjoyed an Ethiopian latte for Jeff and a Chai Tea latte for Joyce. After we are finished with coffee/tea. We walk to the Museé de la Civilissation. It didn’t open until 10am so we had an hour to kill. We found a boardwalk along the St. Lawrence River. There was a nice breeze but no shade. Voila! We create our own shade with our umbrellas! Perfect! We sat and enjoyed the sailboats, speedboats and water ferries. The hour passed quickly and we arrived at the museum. There was a HUGE group of short legs with neon green t-shirts with only one volume-LOUD! Fortunately, they were under the supervision of a number of teachers and it was easy to avoid the section they were in. 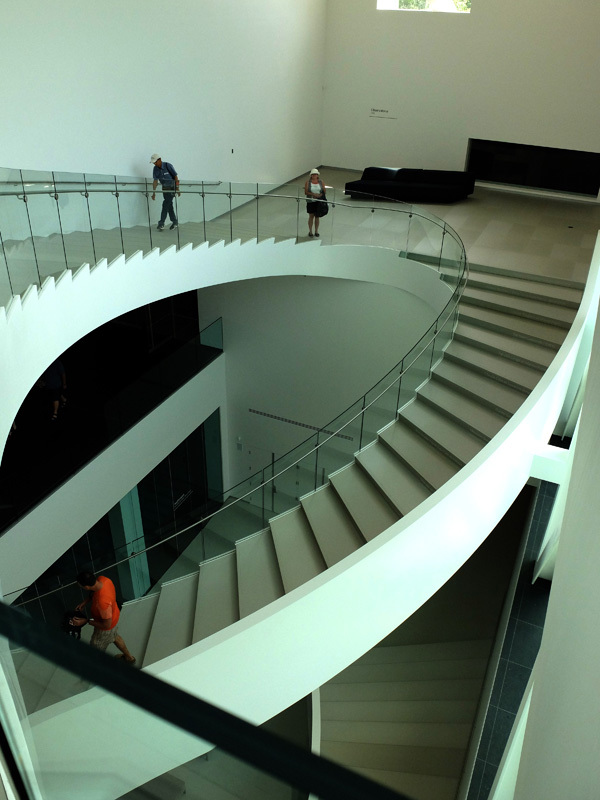 It was a nice museum and perfect for a 90 degree day with the humidity at 80 percent. Rain came pouring down and streamed down the slopped ceiling skylights. 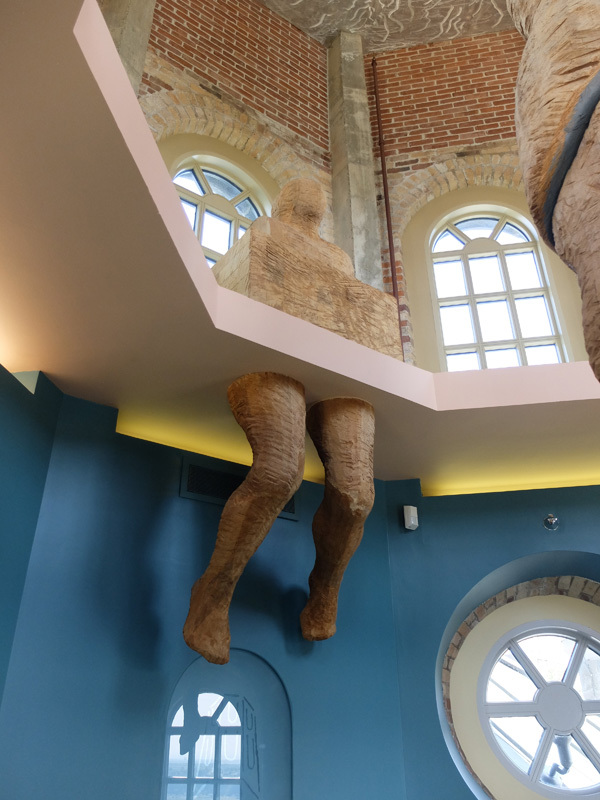 We decided to take a break from the exhibits and stopped in at the museum café and enjoyed a ham and cheese croissant then finished looking at the exhibits. It was still raining outside so we sat and enjoyed the children’s puppet show, all in French, of course. 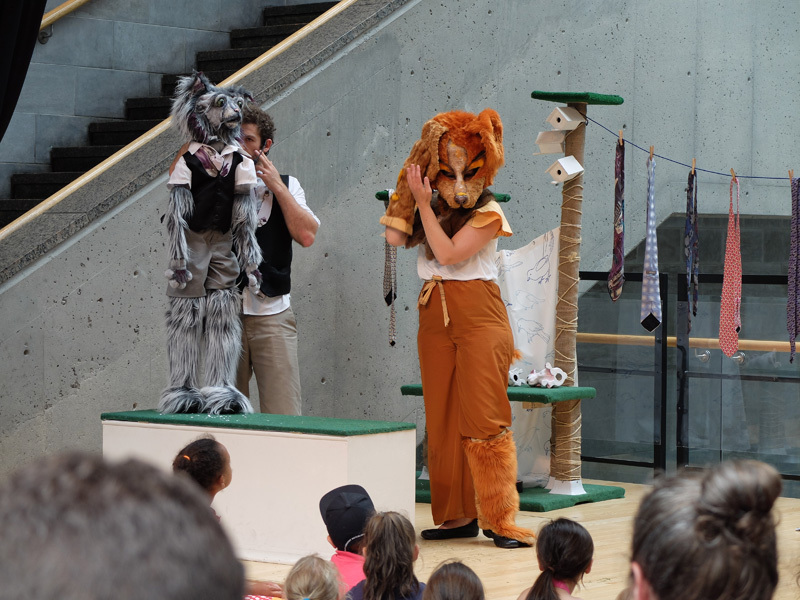 Actors entertaining the children in French. After the rain let up we went outside, walked a bit and found a perfect t-shirt for Jeff. It said, ‘La vie et simple; Manger. Dormir. Parler le Francaise’ (Life is simple: Eat. Sleep. Speak French). A couple of doors down we saw an Irish pub and stopped in for a pint (or two). There was a live band playing blues and jazz. Perfect. After an enjoyable session of blues, jazz, and folk, we walked to the Hobbit for dinner. Cheese tortellini for Joyce and a filet mignon for Jeff. We walked off our dinner and wound up at the Bistro B for a glass of wine and a cheese platter and then turned in for the night. We slept in a bit and got up and out for our last full day. We found a coffee shop, L’Accent, and enjoyed a coffee and mint tea then walked into the Old City. 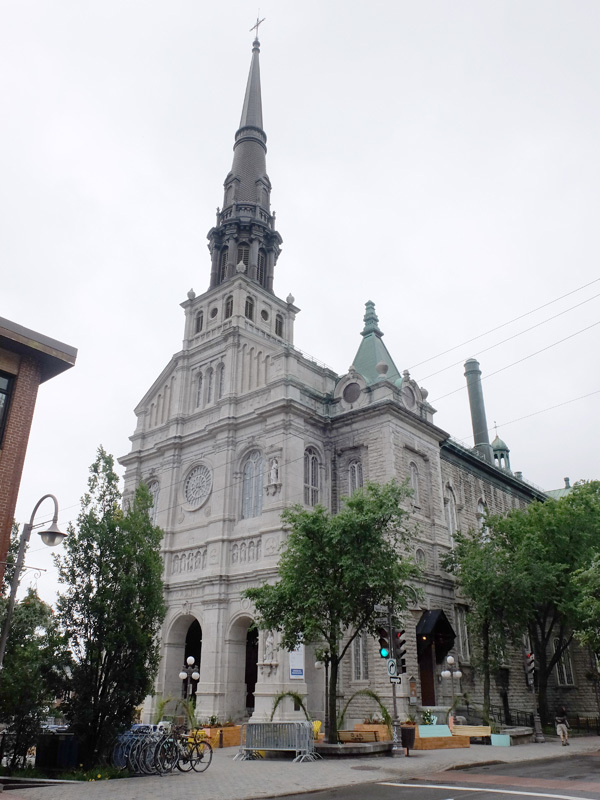 We stopped at the La Porte Sainte at Notre-Dame de Quebec. 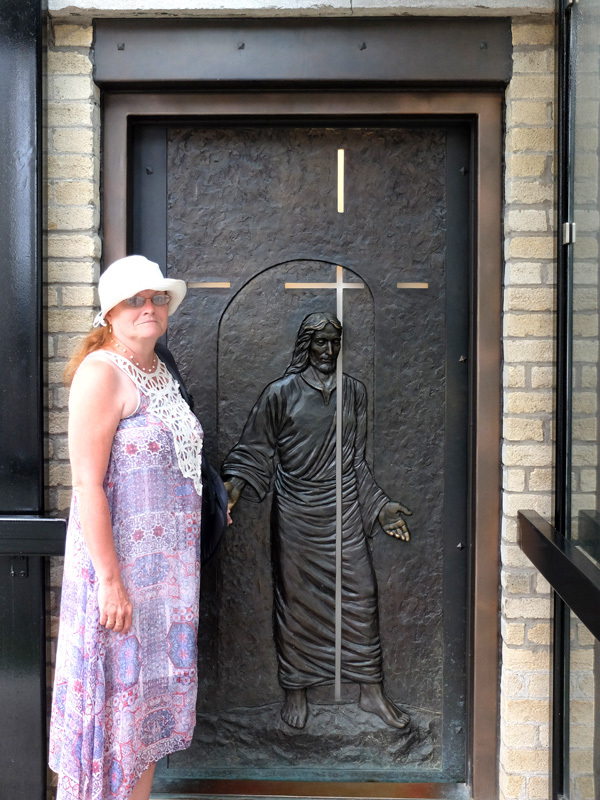 The only Holy Door in the Americas designated by the Holy See and it’s here at the Notre Dame Basilica in Quebec City. 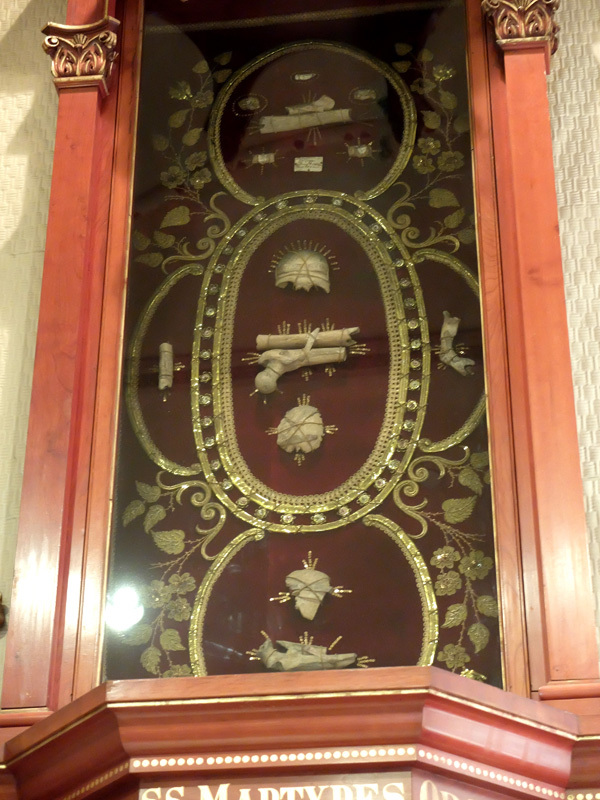 There are only 8 holy doors like this in the world and most of them are in Rome. What’s a Holy Door you might ask? 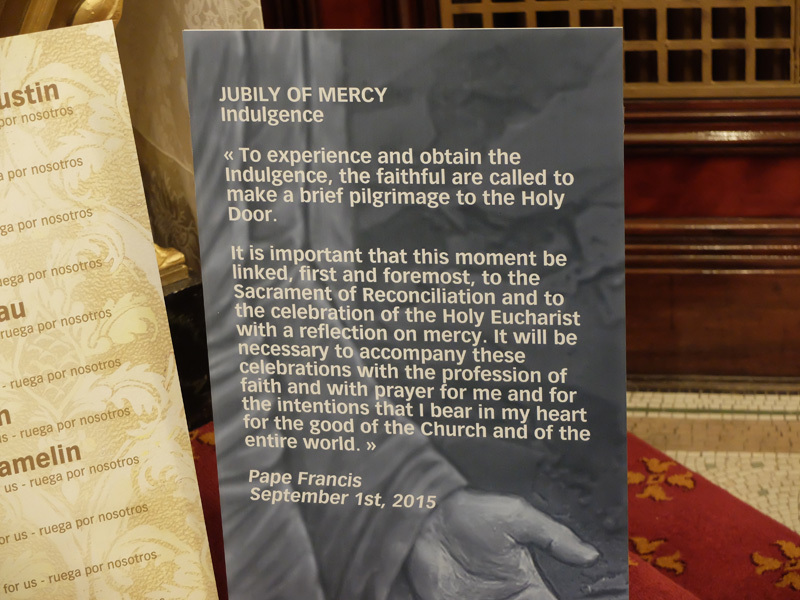 You could Google it like I did, but briefly, it’s a specially blessed door in a basilica which is sealed until a Jubilee year, then opened and gives ‘plenary indulgences’ (sorry, you’ll have to Google that one yourself) to those who walk through it. Just about to enter the Cathredral through the Holy Door. Explanation of the Holy Door. Just across the street from Notre Dame in the Museé de L’Amérique Francophone (Museum of American French History). We signed up for a tour. It’s on the grounds of a seminary established by the first French priests in Quebec City and still functions as a seminary with part of the old buildings now serving as a school of architecture. The buildings on the grounds included a de-sanctified chapel (de-sanctified because it was turned into part of the museum), current housing for students of architecture, a former house of the Sisters (now a museum) that the Priests hired to do the maintenance on the grounds (we’ve come a long way baby!) and current housing for priest just coming into the order. 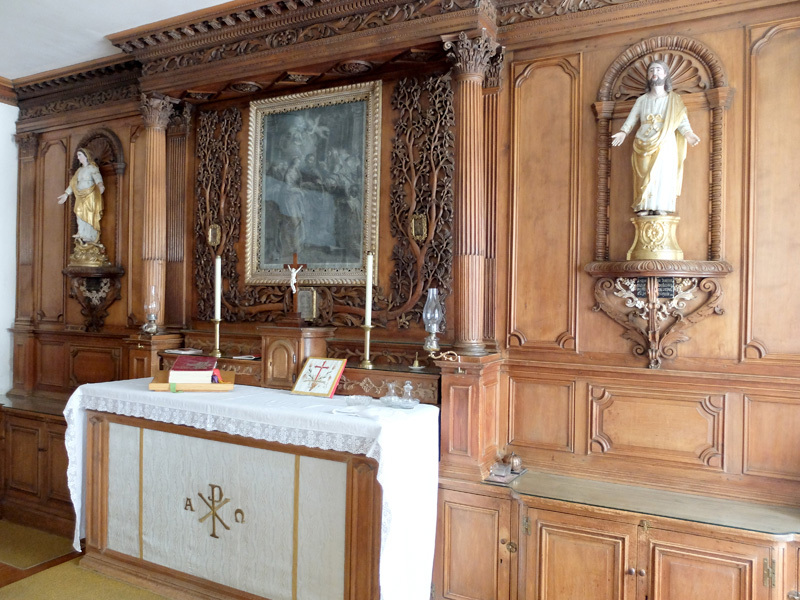 Inside the chapel were several side altars over which were more than 5000 relics of saints that were donated by one of the priests who was trained here ages ago. A case of relics; mostly pieces of bone. A building that now is a school of architecture. Our tour guide was thorough explaining the original buildings as well as their various restorations. 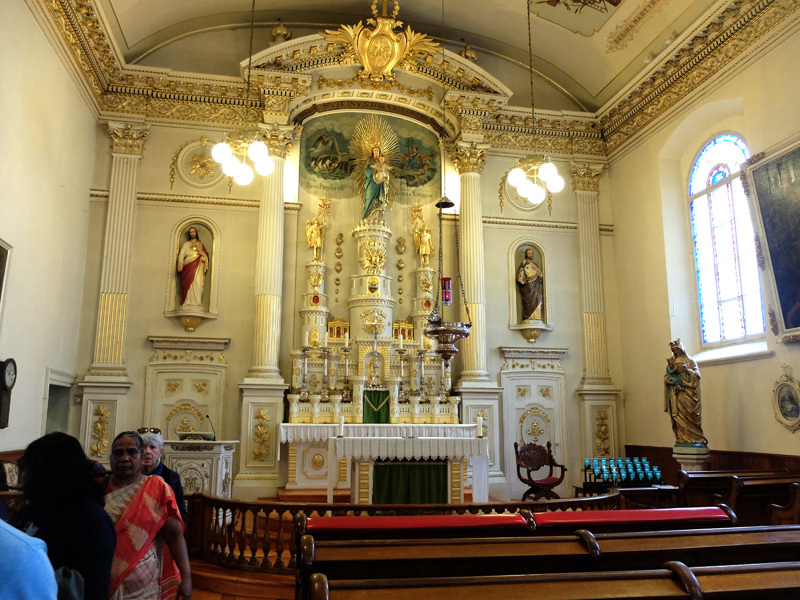 We were able to view a very beautiful inner sanctuary built for a Priest in the 17 or 18 hundreds. Very moving and so interesting. 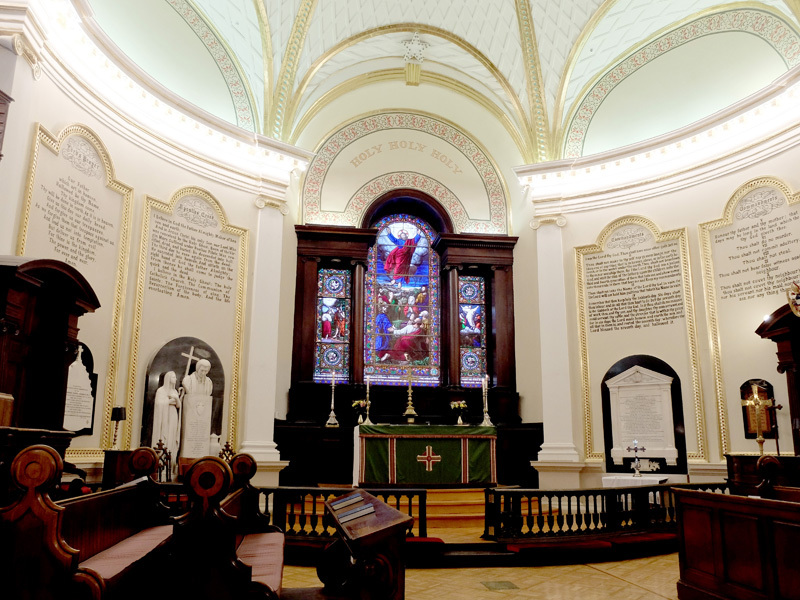 Almost completely original sanctuary from hundreds of years ago. After the tour we spent more time exploring the museum that was formerly the residence for the Sisters. Afterward we found a street performer. We are entertained for a bit and move on to find some lunch. We had a burger and a salad at Le Chic Shack. We got there just as it began pouring rain so we were fortunate to be in and dry. The rain soon let up and we finished lunch and found more street performers to watch. Stilt walking on a ladder. 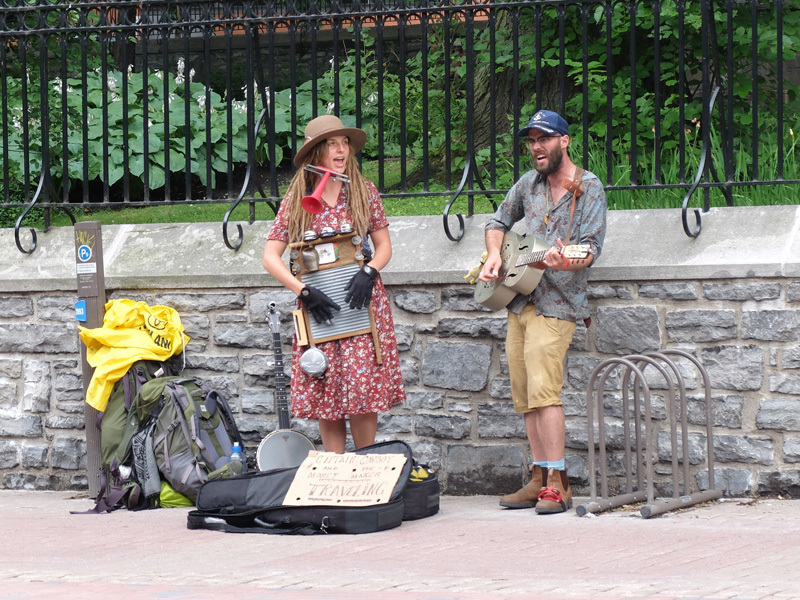 We walked a while and saw a couple with musical instruments who were singing on the sidewalk. We went to the Hobbit across the street from where they are performing and enjoyed a glass of wine with the music. A couple of transient street musicians. The cardboard sign says, “Captain Cowboy and the Money Maker”. After that, we walked some more until it was time for dinner. We had reservations for counter seats at Bistro B. Wow! The counter was an excellent choice for dinner and a show. 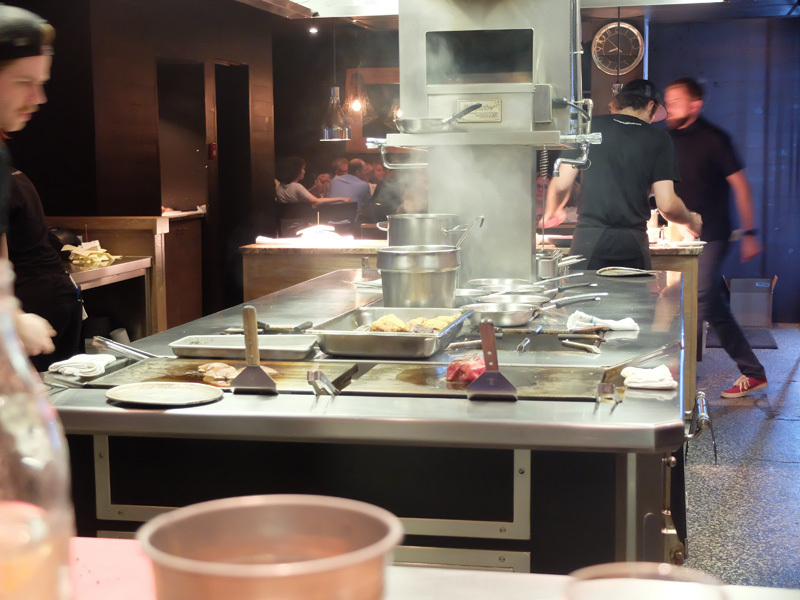 We had seats overlooking the open kitchen which was a well-oiled machine right in the dining area. We watched the cooks and other staff getting out the many entrees, main courses and desserts. We ate rabbit wrapped in bacon for Jeff and Duck for Joyce. Totally the best meal yet!! Kitchen staff working right in front of our counter seats. We rose, showered and looked for coffee and tea. 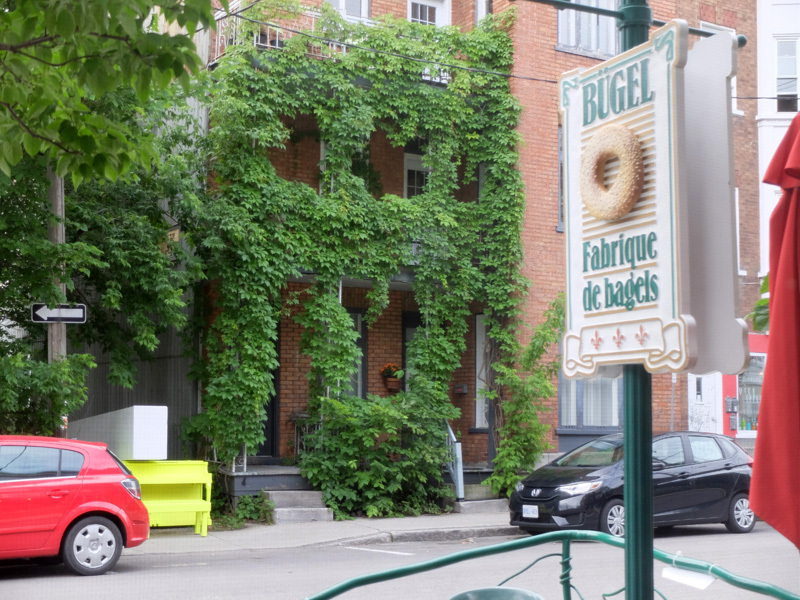 Found a bagel shop, Bügel Fabrique De Bagels, and enjoyed breakfast. Rosie got us a ride to the airport and we left with wonderful memories. Bugel Bagel shop sign and city art across the street (yellow piano with big white block on it). The flight to Toronto went well and we had only about a 15 minute layover before boarding for Chicago. At Midway, we wanted to get an Uber car and tried to follow the sign directing us to ‘Ride Share Services”, but it took us to a parking garage and we needed to get to the departure gates. We didn’t see an obvious way to get there so we opted for a cab. They probably made it difficult to use Uber on purpose. A great way to celebrate 30 years of love. How will we celebrate 60 years of love? The adventure continues. If you want to see more pictures from our trip, click on the tab at the top of the page labeled, "Art, Sights, etc.". Copyright © 2016 Jeff & Joyce Oravec. All Rights Reserved.